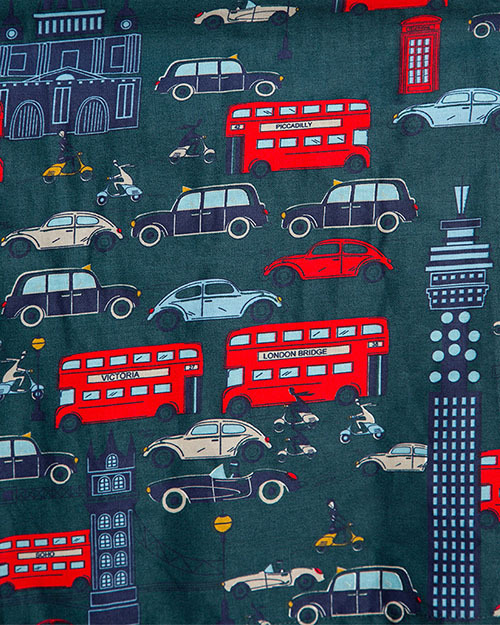 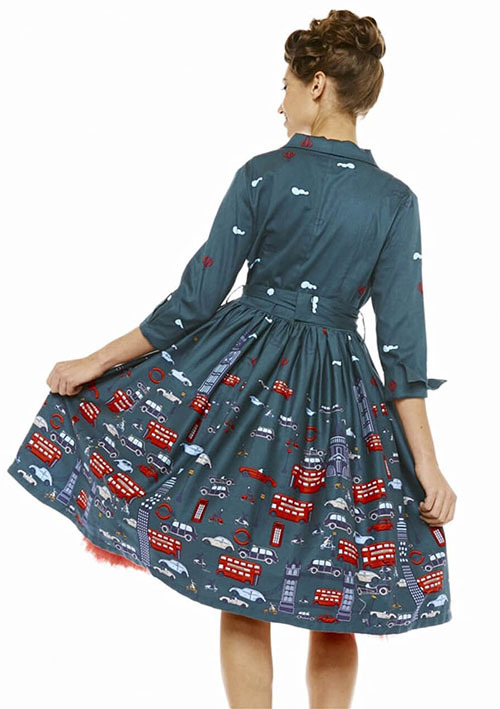 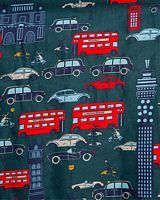 This is a new with tags Gilda dress from Lindy Bop, in the sought-after London Traffic print. 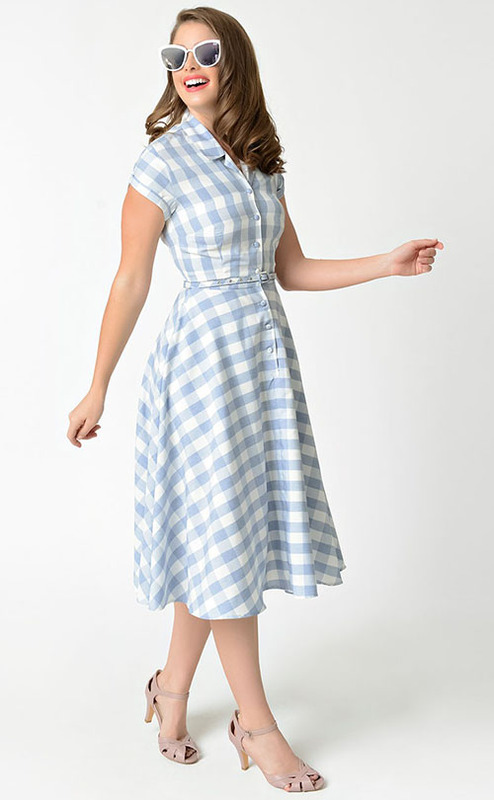 Made from a fully lined 97% cotton 3% elastane, this classic 1950's shirt-style swing dress features a fitted bodice with fabric covered functioning buttons, cap sleeves, wide flare skirt with box pleat detail and side seam pockets, and a concealed side zip. Size 14 UK (US Size 10), which fits as a Size 12 Australian, the size chart says should measure (actual garment) 40.2" bust, 32.7" waist, 41.3" long, 17.5" armhole and 15" cuff. 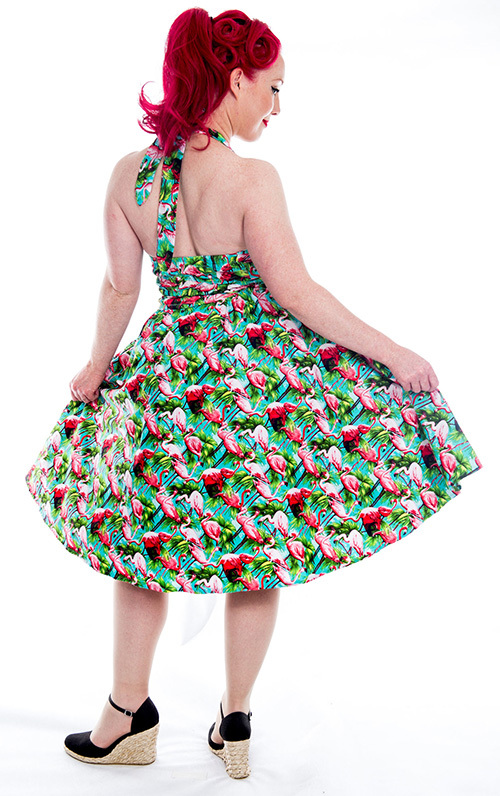 I find the waist on this runs smaller than quoted, at 31" (79cm) so please do take that into account. 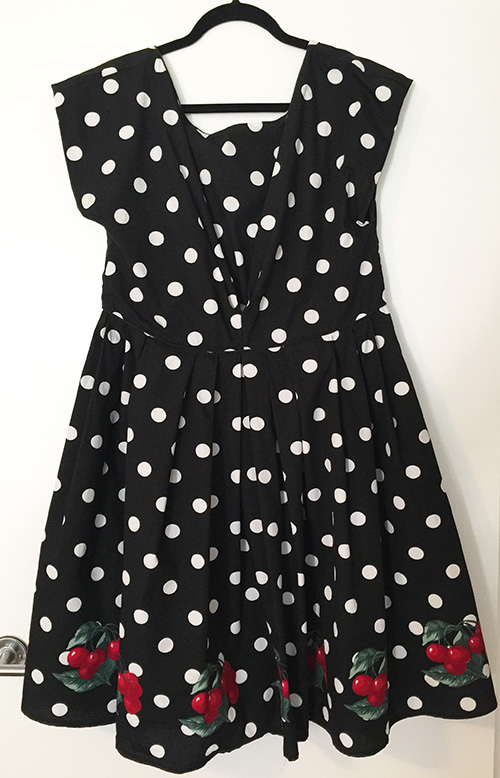 This is brand new with tags. This weighs over 600g so will need a larger satchel. (32") on the waist, and 86cm (33 1/2") long and is new and unworn - the cardboard swing tag itself has gone missing but the plastic loop on the label remains. 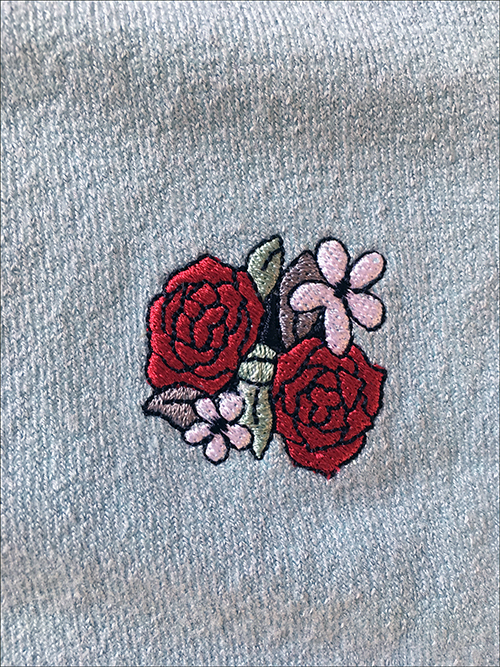 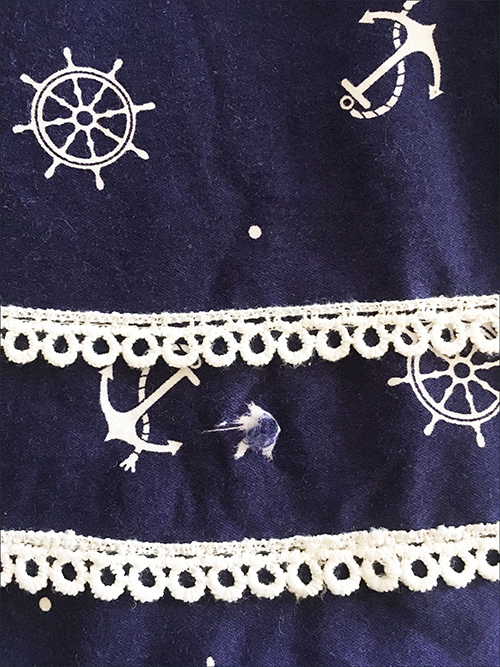 This does have a small fabric flaw as shown in the close-up shot, but as this is on the rear bottom hemline it would never be noticeable when worn. 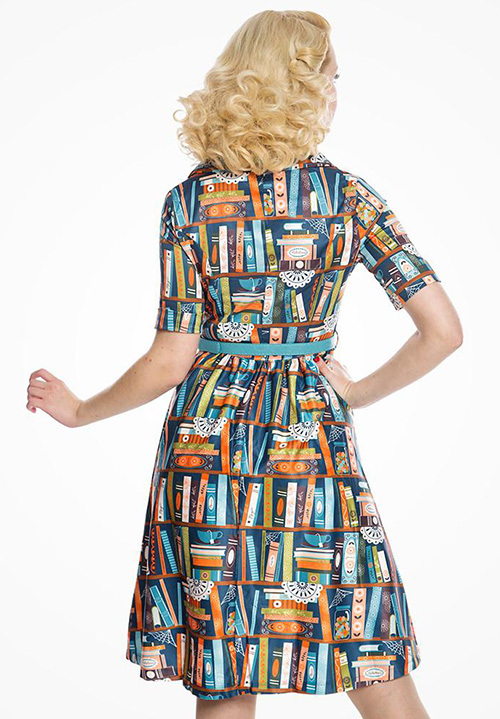 This just fits into a 500g satchel. 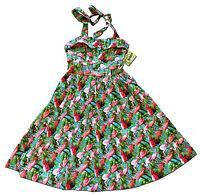 This is the stunning FlaminGo For It Halterneck Dress from Inspired Insanity, in a crisp 100% cotton with the most fantastic kitchy flamingo print. 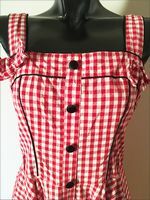 It features a fitted bodice with side zip, a sweetheart neckline, that has a turn down collar trimmed in cherry red, and matching covered buttons. 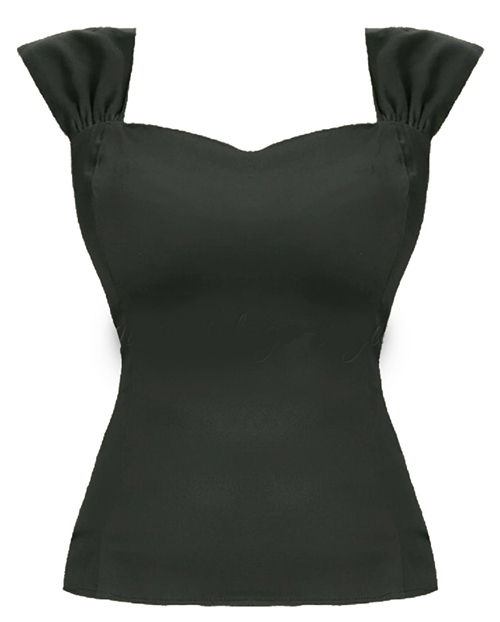 The back of the bodice is elastic shirred from the top to the waist band for a perfectly tailored fit. 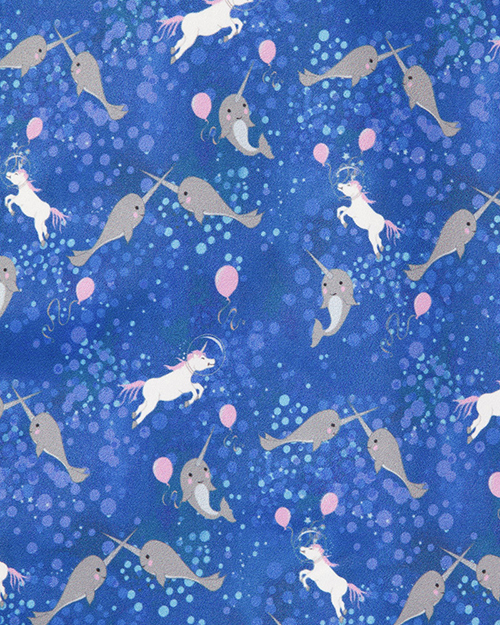 The shirring allows for plenty of stretch and gathering. 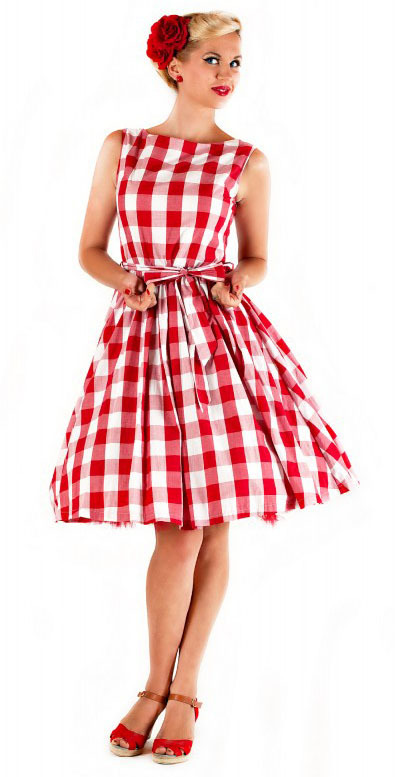 Add a petticoat (not included) to attain the look in the stock photos. 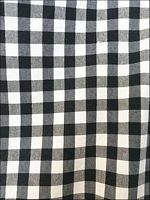 Tagged/Sold as a Size L to fit Size 12 and Bust 91cm (36"), Waist 76cm (30") and Hip 96cm (38"), and it's about 82cm long from underarm to hem. 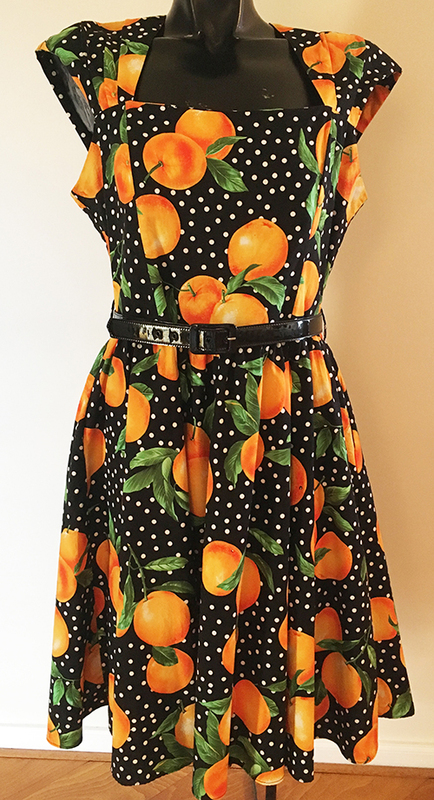 This is brand new with tags. 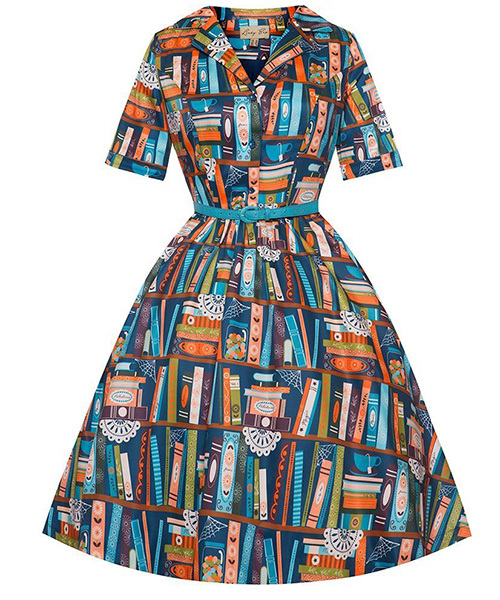 This fits into a 500g satchel. 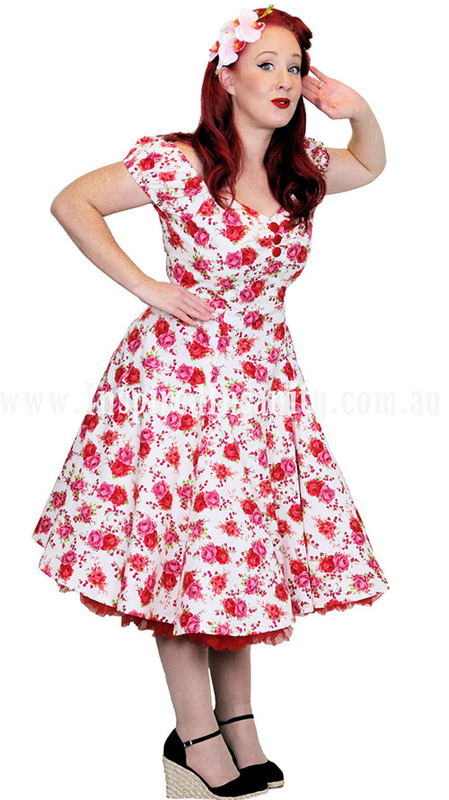 This is the stunning Spring Fling dress from Inspired Insanity, in the most gorgeous Rose Print 100% cotton with elasticised sleeves, a rear zip with hook-eye closure, decorative buttons on the bodice and a beautifully full 50's skirt - add a petticoat (not included) to attain the look in the stock photos. 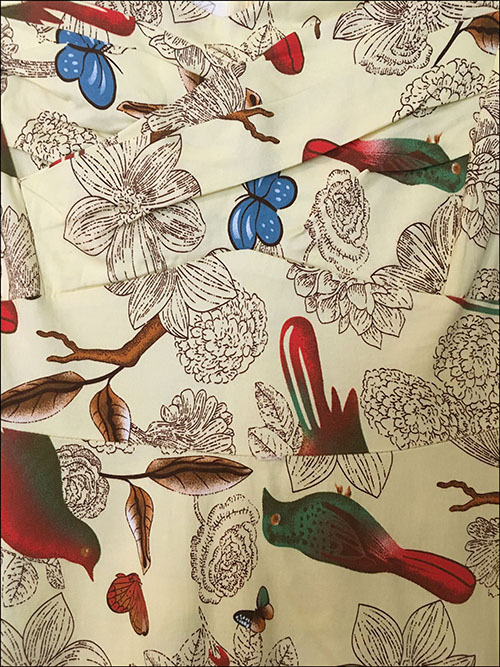 Tagged/Sold as a Size XL to fit Size 14 and Bust 96cm (38"), Waist 81cm (32") and Hip 101cm (40"), it measures about 83cm on the waist and 112cm long shoulder to hem - please note that the fabric has zero stretch. 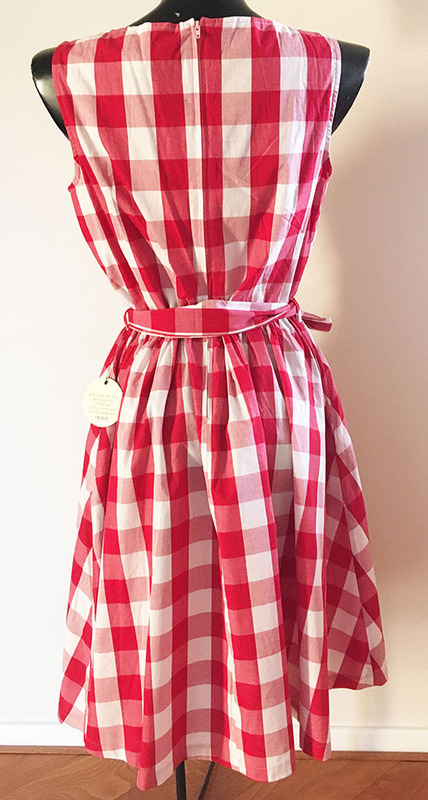 This is brand new with tags. 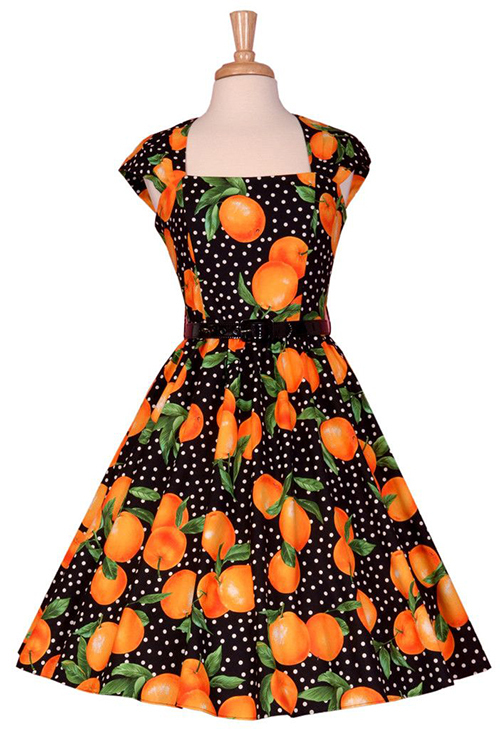 This is the lovely Veronique dress from Bernie Dexter in her fab Juicy Oranges print. 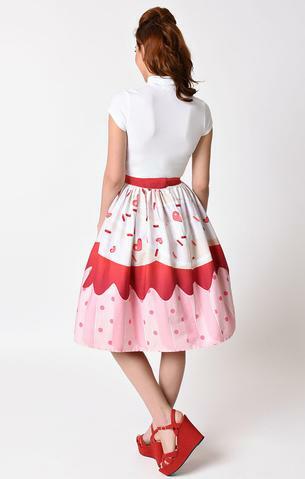 A 100% cotton fabric with no stretch, this is a Size XL, measuring about 98cm on the bust, 82cm on the waist, and 100cm long shoulder to hem, and includes the original black patent leather belt. 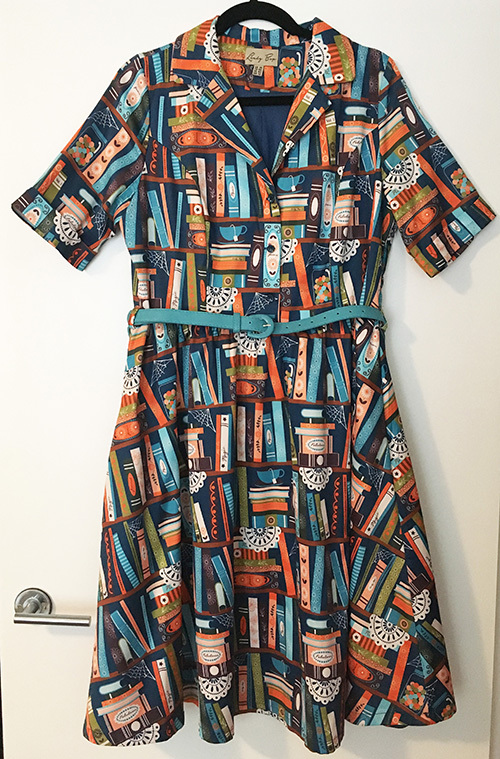 This is in flawless, as-new condition. 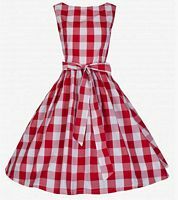 This is one of my all-time favourite dresses, and one that definitely always gets compliments, even from complete strangers - it's the Picnic Check Audrey from Lindy Bop in the red colourway. 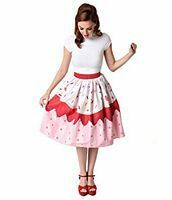 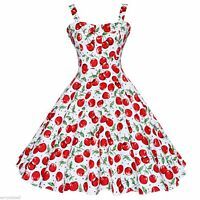 It features a fully lined bodice, rear zip, and detachable waist sash, with a gorgeously full 1950's skirt - add a petticoat (not included) to attain the look in the stock photos. 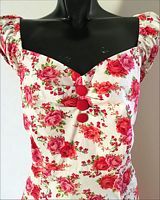 Size 14 UK - normally I'd advise going on the waist measurements for most dresses, but in this one it's the bust that seems to run small, perhaps due to the lining. 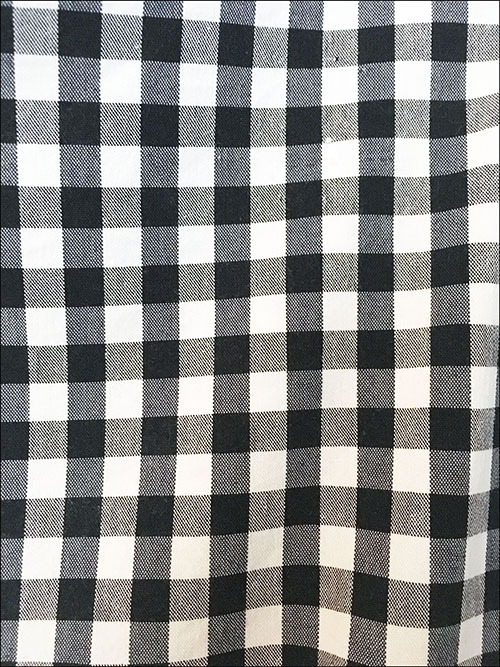 That said, the gingham cotton has zero stretch and this is is best treated as a smallish Australian Size 12, measuring about 94cm (37") on the bust, 78cm (31") on the waist and 105cm (41.5") long. 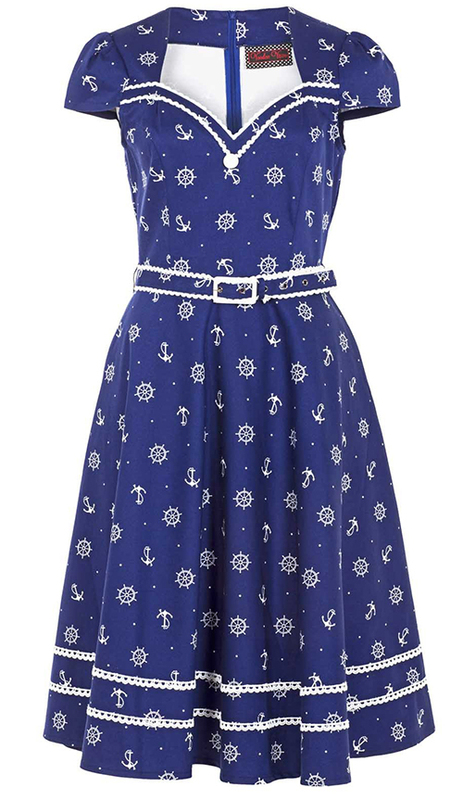 Brand New With Tags, I bought the wrong size without checking the measurements! 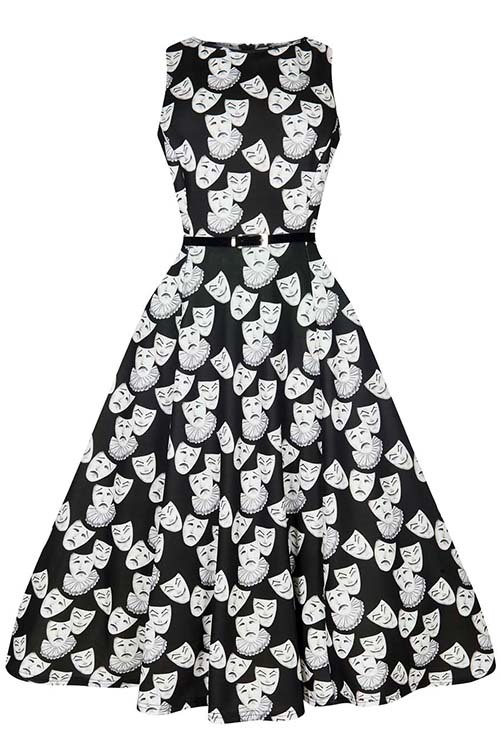 One of the best dresses you will own! 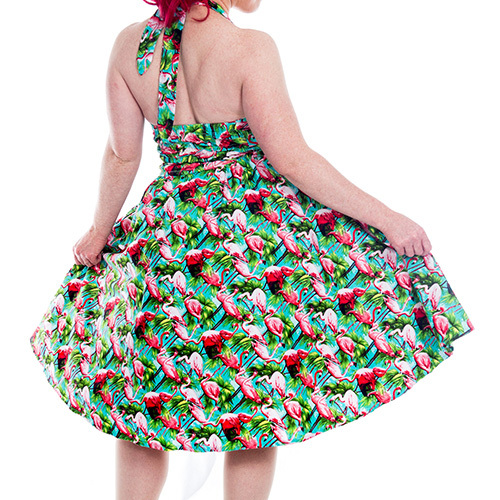 Swing your way right into his heart in the Hell Bunny Chantal dress! 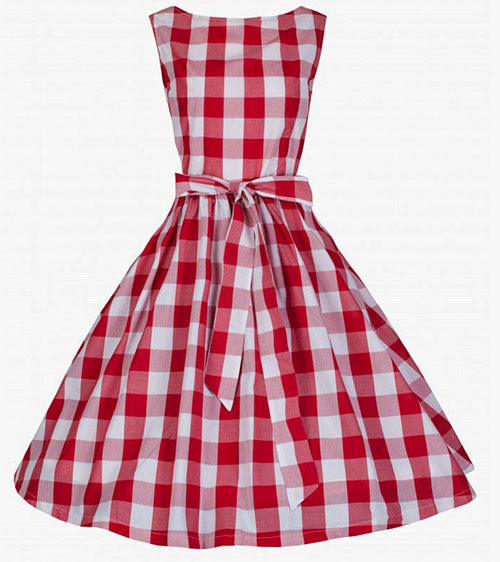 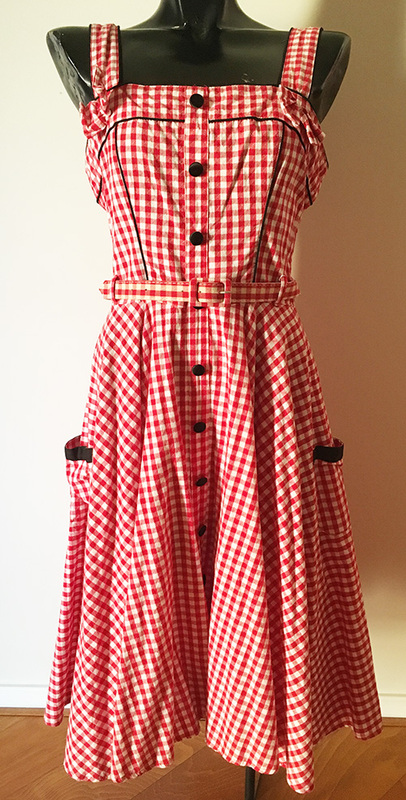 This vintage inspired, red & white gingham swing dress features a fitted bodice into a full swingin' skirt, decorative buttons & bows, adjustable belt, smocked sides & zips up the back. 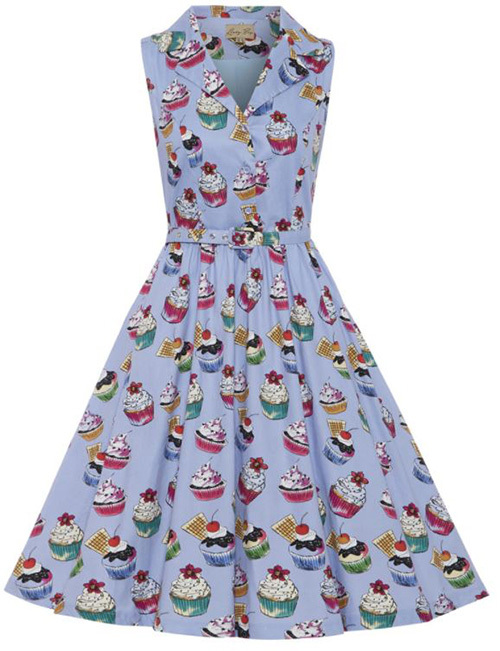 Best part is this dress has pockets too! 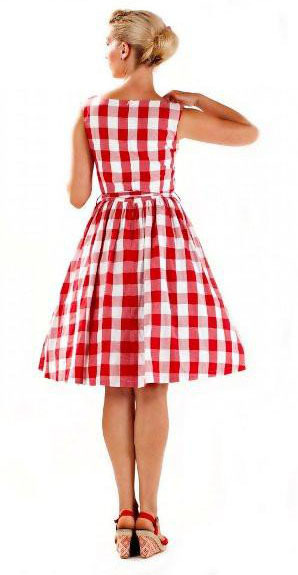 Add a petticoat (not included) to attain the look in the stock photos. 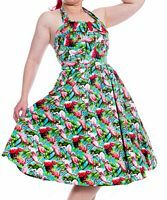 Made from a quality 98% Cotton/2% Spandex blend, this is a Size Large which Hell Bunny quote to fit Bust 96cm (38"), Waist 81cm (32") and Hip 102-104cm (40-41"). 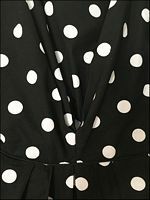 I measure this as 78cm (30.75") on the waist which will stretch a little with the ruching, and 109cm long shoulder to hem. 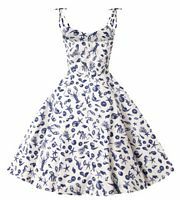 This is in excellent, gently used condition with barely any wash fade or wear to the dress. 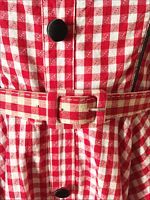 I am including the belt but as you can see it's discoloured (yellowed) over time sadly, and would be best swapped out for a plain black one. 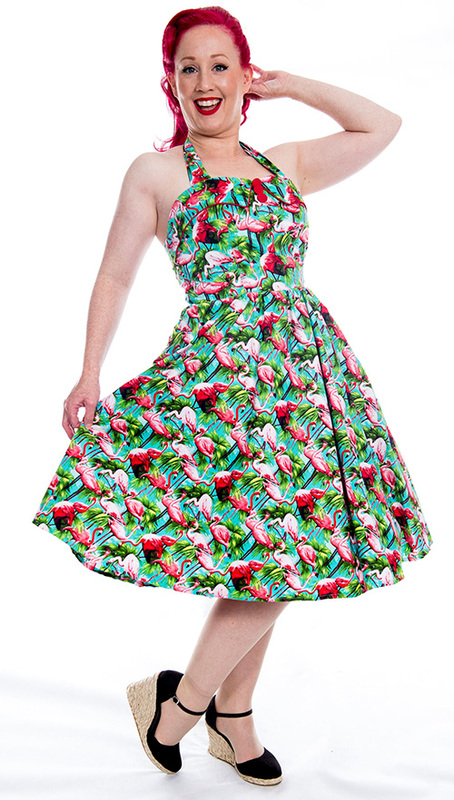 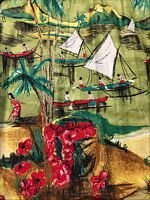 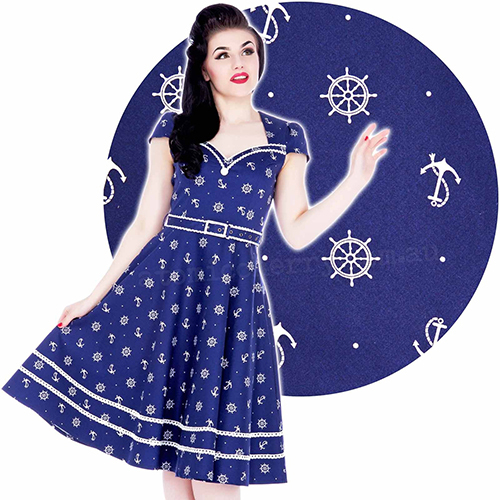 Sail away to a tropical island in the beautiful Tahitian Dream dress from Retrospec'd. 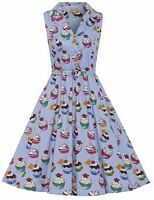 Australian made in a sumptuous quality 100% Cotton, this gorgeous 50s halterneck dress features a dreamy print with poppies, palm trees and sailing boats, with a cross over bust, button straps with 2 settings and pleating into the waist. 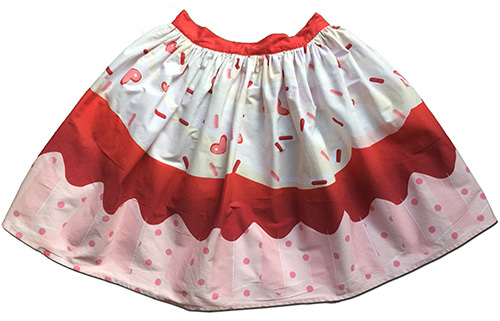 Add a petticoat (not included) to attain extra fullness in the skirt. 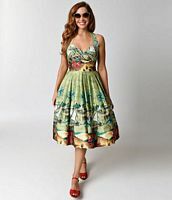 Size 14 which according to the Retrospec'd size chart - attached - should fit bust 95-100cm, 84cm waist and 69cm skirt length, I actually measure this (I checked three times!) as 82cm on the waist so please do take that into account as the fabric has no stretch. 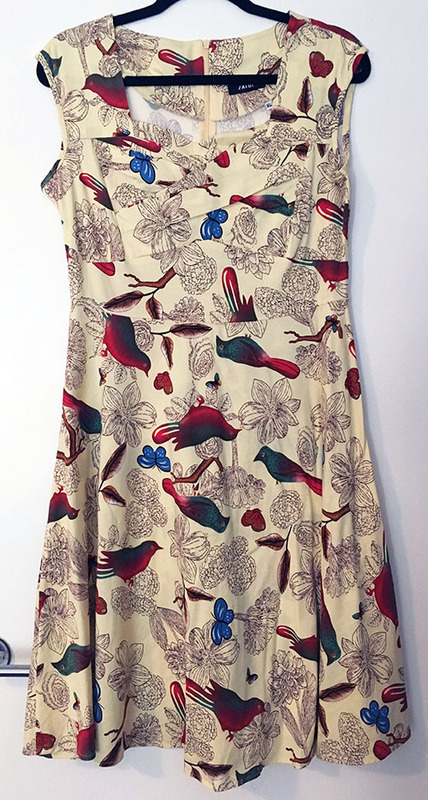 This is brand new with tags. 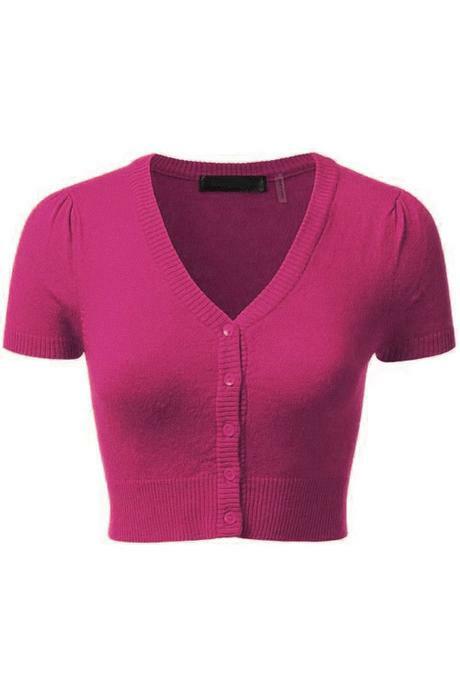 Mak sweaters are an essential item, perfect for wearing over dresses with their fun cropped pinup style, ultra-soft and lightweight knit fabric (80% acrylic, 20% nylon), short sleeves, v-neck, and button front. 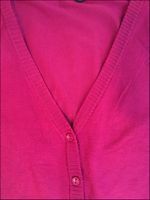 This is in the Magenta colourway which is a little darker than my camera has captured, and closer to the stock photos. 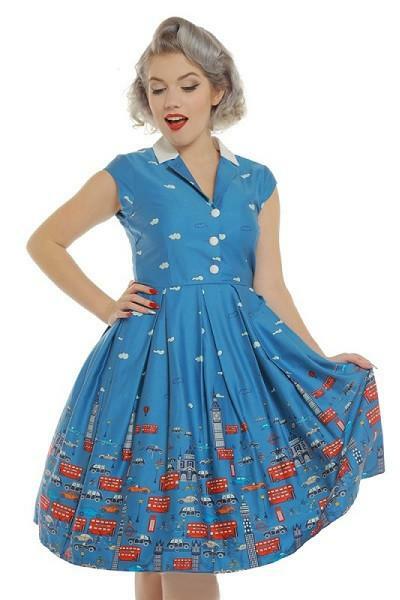 Size 1X which will fit loose and comfortably for a Size 14-16 or more snugly on a Size 16-18. Unstretched, it's about 100cm around the bust under the arms, 94cm around the waist, and 48cm long shoulder to hem, and is in As New condition - worn once only. 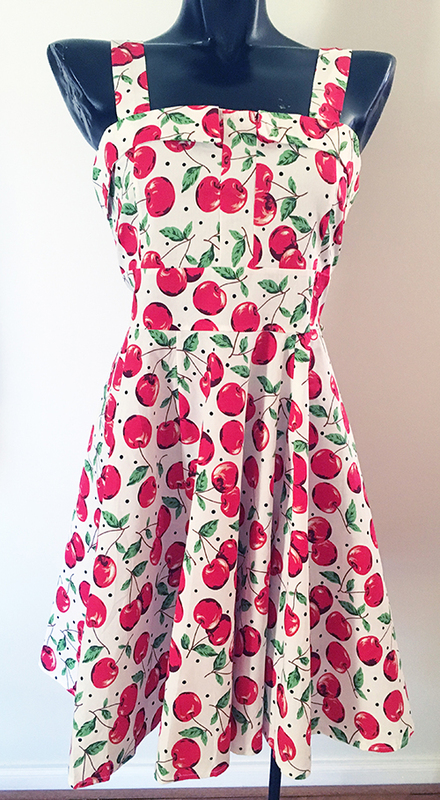 This gorgeous dress from Zaful is in a white stretch cotton elastane blend with a fabulous all-over cherry print. 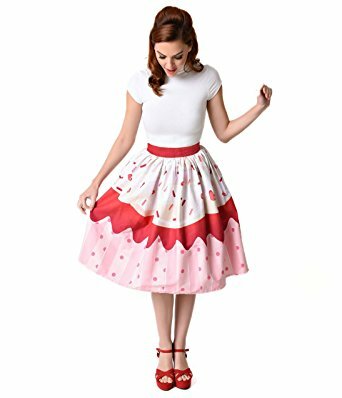 It features waist sash ties, a concealed rear zip, and full 50's circle skirt - add a short petticoat (not included) to attain the look in the stock photos. 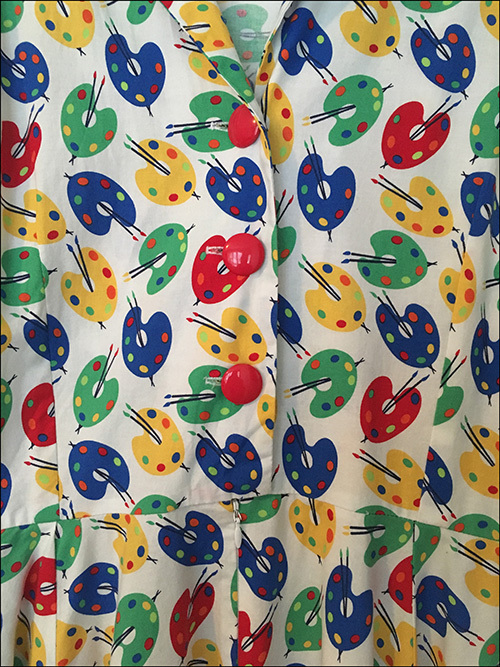 Tagged Size XL, this fits me as an Australian Size 14-16. 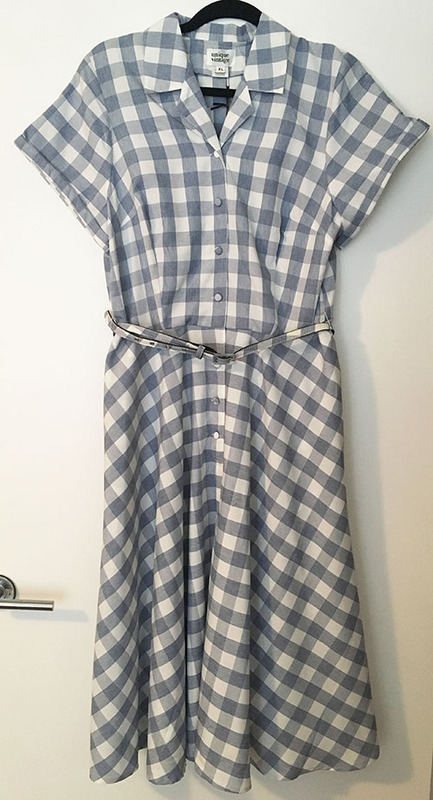 Laid flat and unstretched - and the fabric has a decent stretch to it - it's about 86cm on the bust, 81cm on the waist, 90cm long from shoulder to hem, and is brand new with tags. 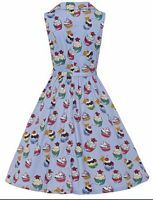 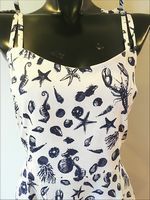 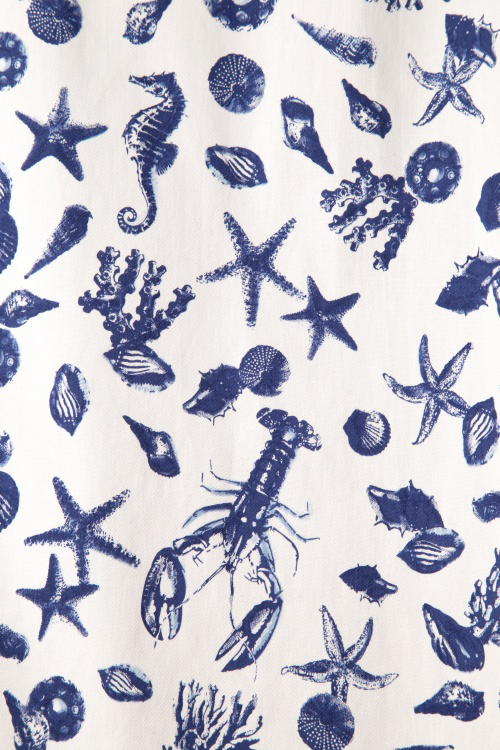 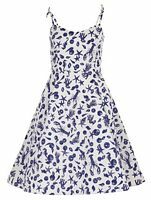 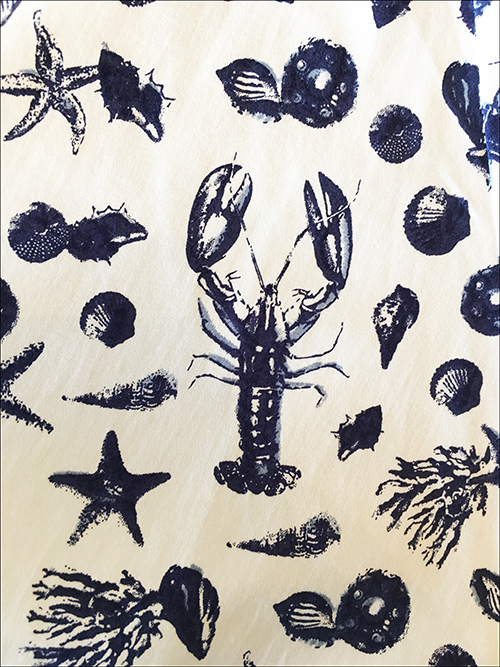 This is the amazing Janie dress from Collectif UK in the Seashell print, featuring Starfish, Shells, Seahorses and Lobsters amongst other things - just the most fantastic design. 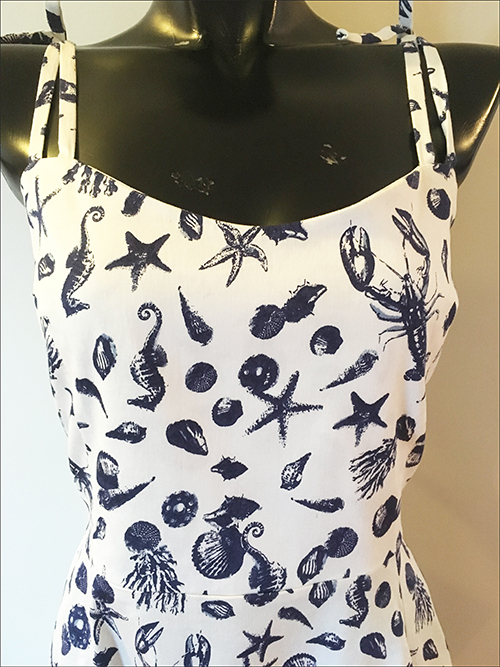 Made from a 97% Cotton 3% Spandex blend, it features adjustable double shoestring shoulder straps and a concealed rear zip, and is a Size Large / 14 UK (Euro 40, US 10). 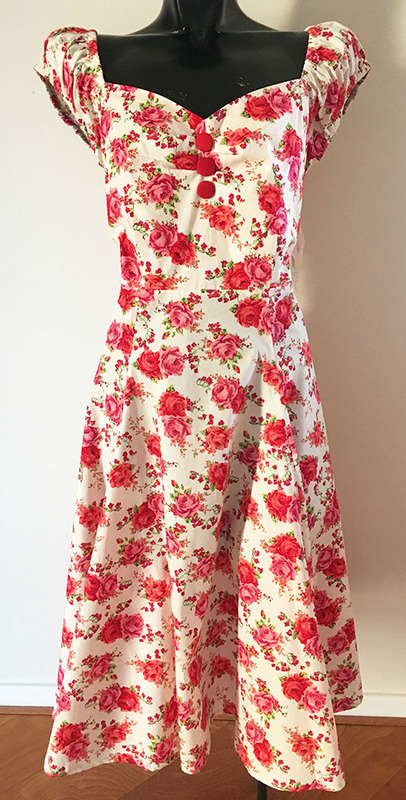 Laid flat and unstretched measures about 98cm on the bust, 82cm on the waist and 109cm long shoulder to hem (adjustable) and is brand new with tags attached. 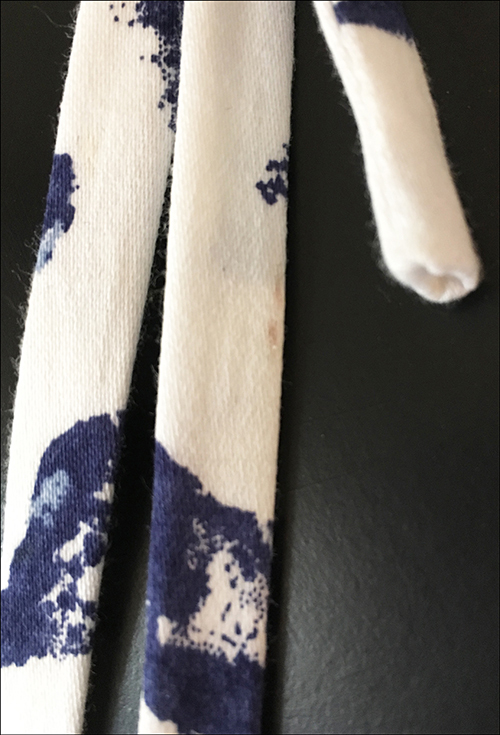 I can spy the tiniest mark on the right strap - just some shop soiling which would hopefully shift with the first wash otherwise would never be spotted when worn. 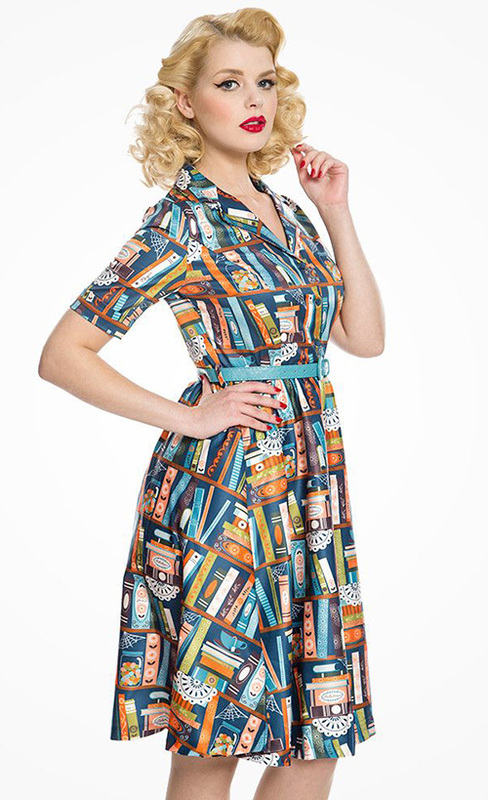 Classy and fabulous, darlings! The Coco Top is the ideal addition to any Pin-up closet. 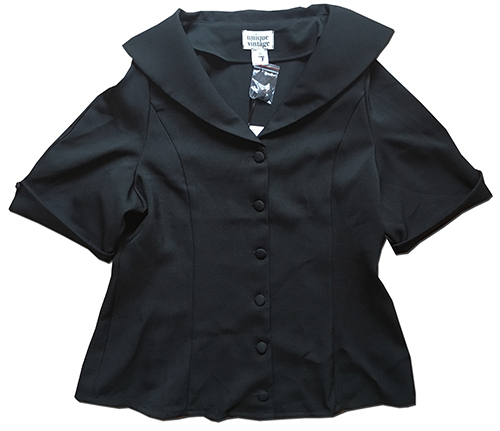 Cut in an elegant vintage style, this fashionable black blouse is a sturdy woven blend, featuring befitting short sleeves with dainty button detail and a refined button up front. 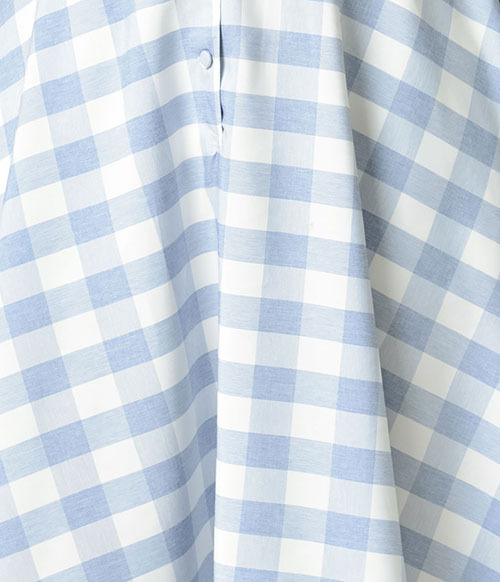 The polished V-neck is outlined with a wide tailored collar and pristine princess seaming for a curve hugging fit. 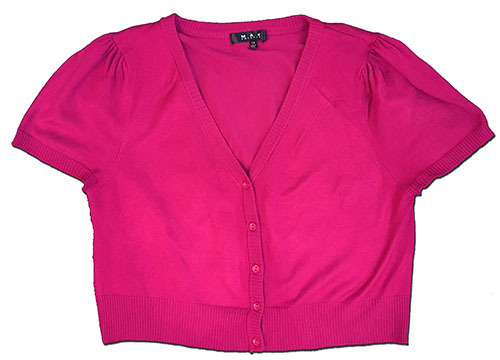 Graceful matching fabric buttons top off this beautiful basic. 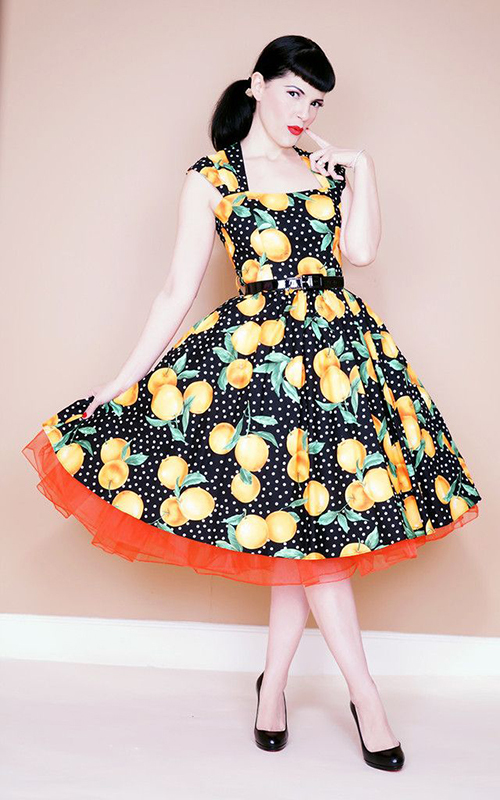 Coco is impeccable! 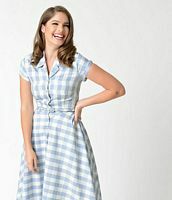 Sewn in a 95% Polyester 5% Spandex (fabric has little stretch), this is a Size XL which according to the Unique Vintage website should fit American Size 12/14 (Australian Size 14/16), Bust 41-42" (104-107cm), Waist 33-34" (84-86.5cm) and Hip 44-45" (112-114cm). 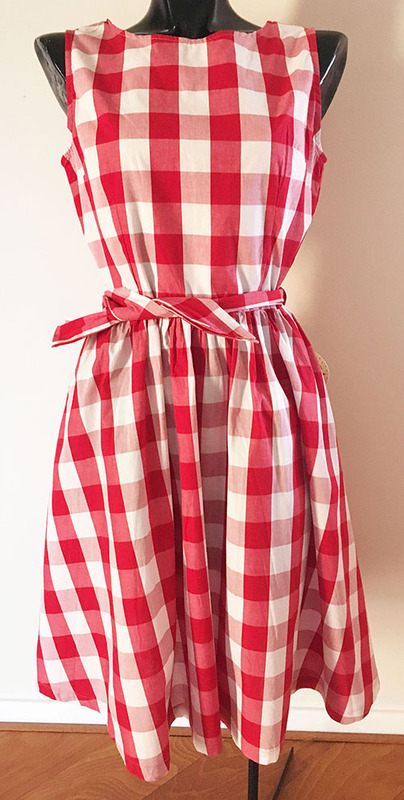 Anecdotally these run a tiny bit small on the bust so please note that laid flat this measures about 102cm on the bust under the arms, 88cm on the waist and 63cm long shoulder to hem. 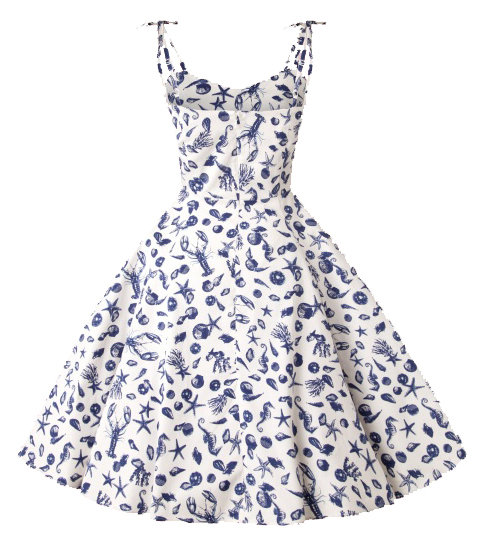 This is brand new with tags attached and retails at $US48 (about $AUD65 - price tag reads $70). 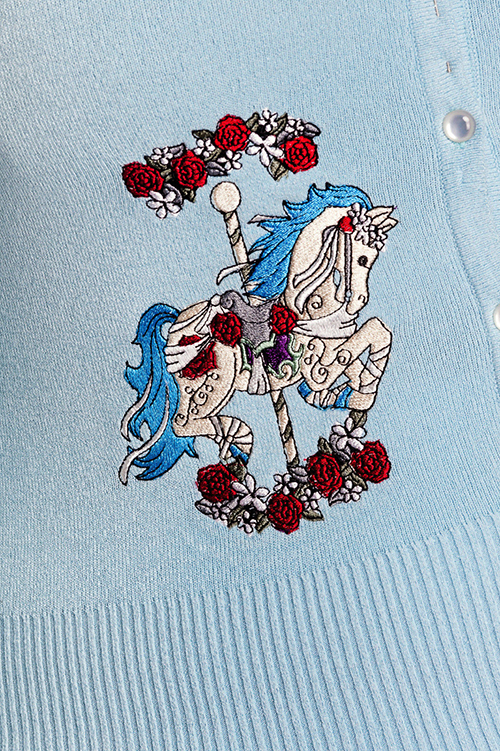 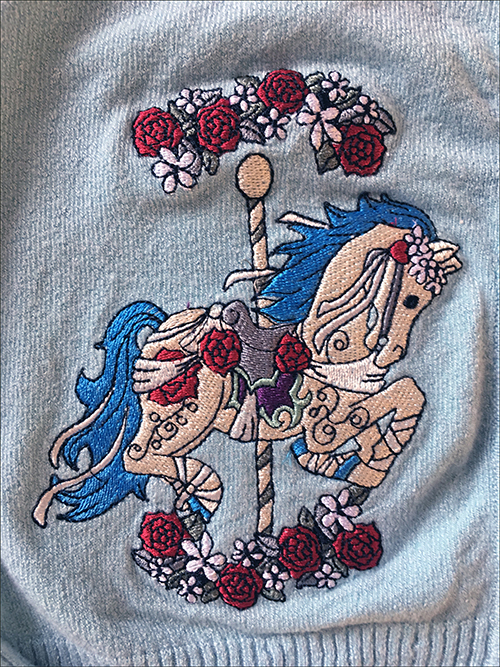 This beautiful cardigan from Hell Bunny is in a powder blue, super-stretchy 80% Rayon, 15% Nylon 5% Elastane blend and features gorgeous embroidery of roses and a Carousel horse on the front. 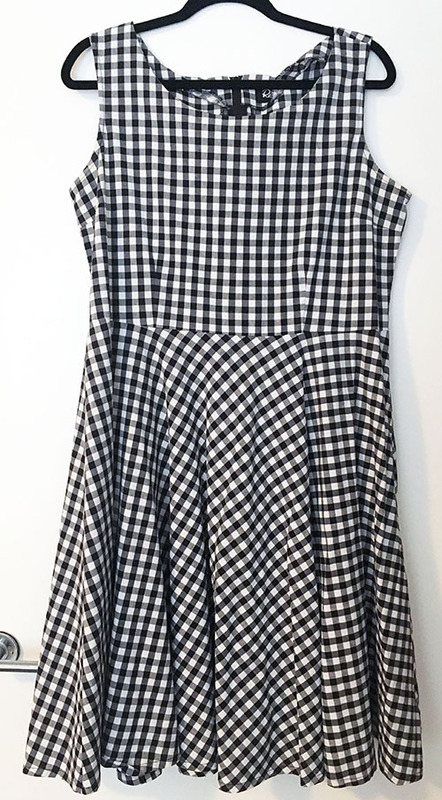 Size Medium, laid flat and unstretched it's about 90cm on the bust, 72cm on the waist, and 47cm long from shoulder to hem, and is brand new with tags attached. 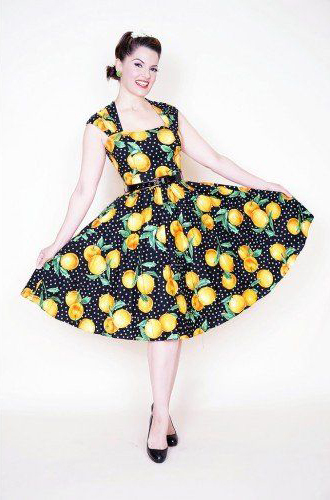 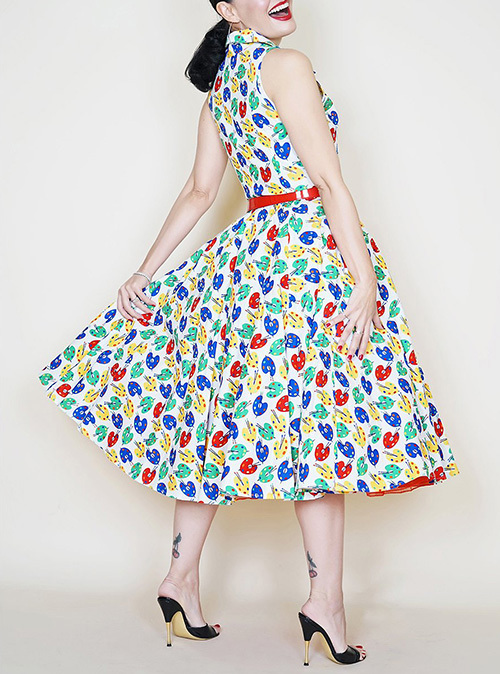 This is the gorgeous Jill top from Collectif UK - an essential piece that will go with anything! 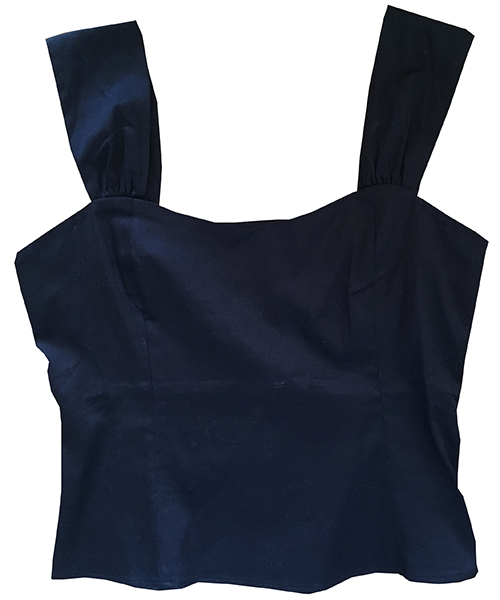 Sewn in a black 98% Cotton 2% Spandex, it features flattering wide shoulder straps and a concealed side zip, and is a Size Large / 14 UK (Euro 40, US 10). 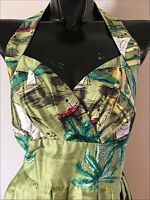 Laid flat and unstretched it measures about 98cm on the bust, 82cm on the waist and 55cm long shoulder to hem, and is brand new with tags attached. 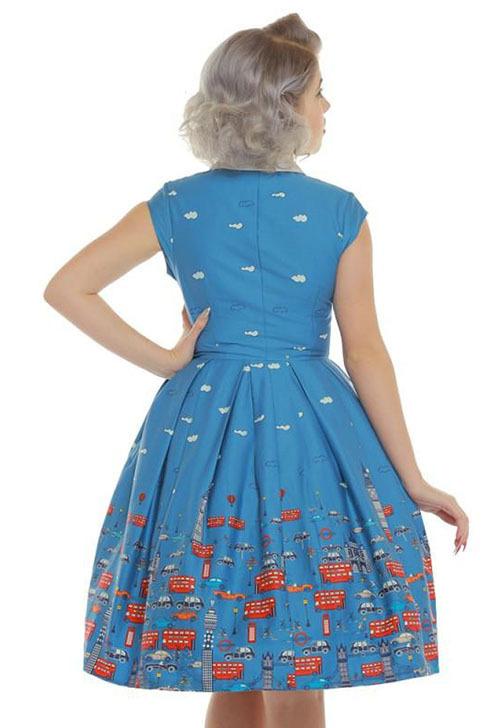 This is the beautiful Janet dress from Collectif UK, in the incredible Blue Floral Toile print. 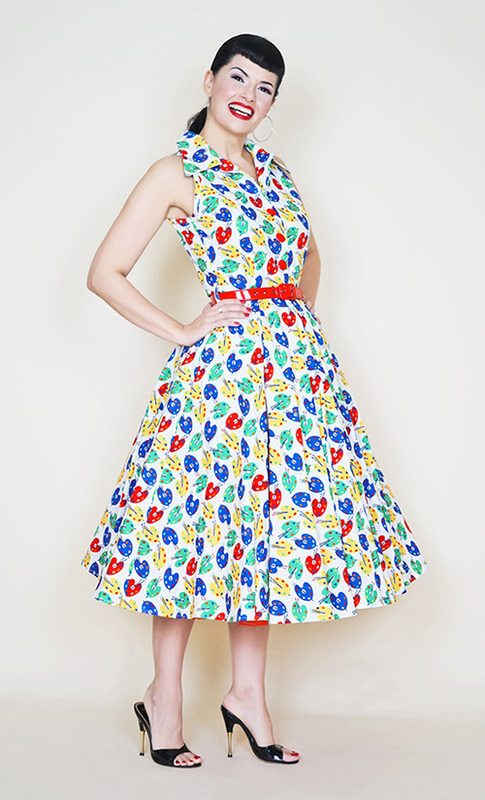 From the Collectif site - "Janet is a traditional 1950s style shirt dress. She has a flattering open collar, vintage style single button closure, symmetrical patch pockets, and small turn up cuffs. 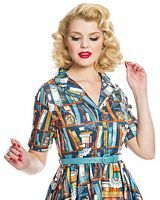 She also has a full, gathered skirt with side pockets, a centre back zip, and a wide matching belt with metal eyelets and spoke. 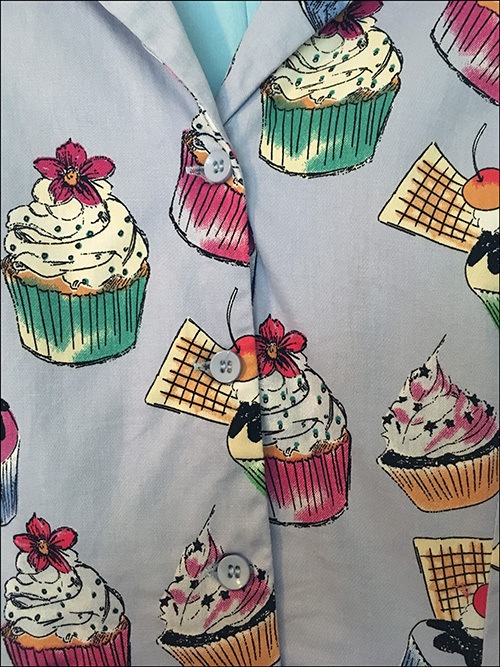 She is made in our Toile Floral stretch cotton; a classic blue china inspired print of beautiful blossoms." 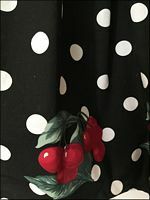 The fabric is a nice weight 97% Cotton 3% Spandex blend. 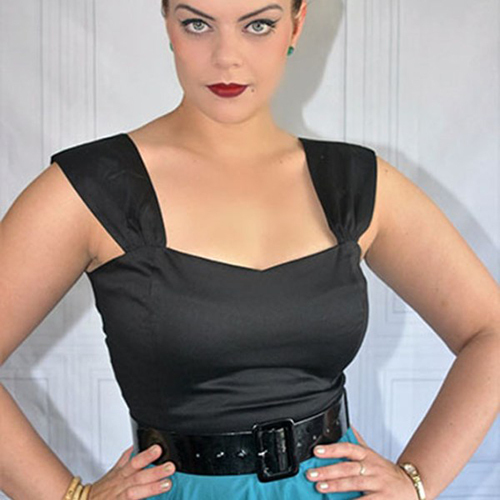 Size UK 16/XL which according to the Collectif size chart is to fit Bust 42-44", Waist 34", Hip 42-44" and Australian Size 16, and it measures about 100cm on the bust, 86cm on the waist and 100cm long shoulder to hem. 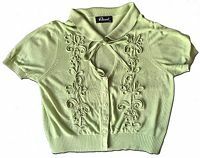 This is in excellent used condition with just a tiny amount of pilling under the arms. 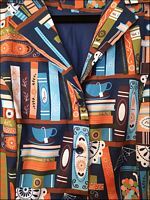 This weighs about 650g so will need the larger satchel. 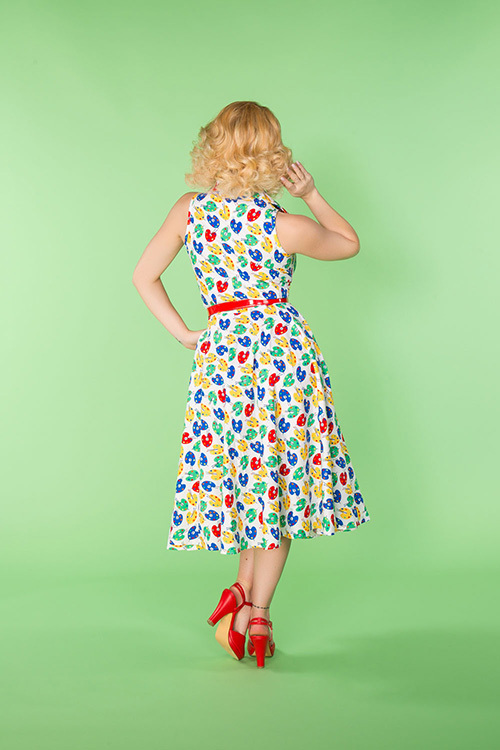 This is the gorgeous Lydia Paint Palette dress from Bernie Dexter in the white colourway. 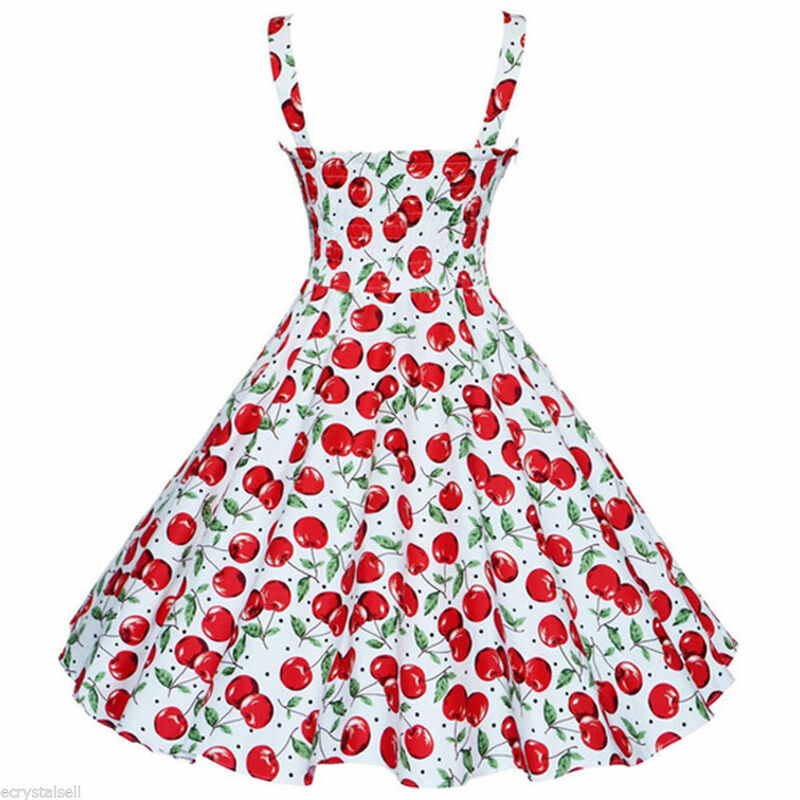 A super-flattering sleeveless design with full circle skirt, it fastens with a zip up to the waist and then 3 large red buttons on the bodice, which tie in with the bright patent leather belt (not pictured in my photos but definitely included, as seen in the stock photos). 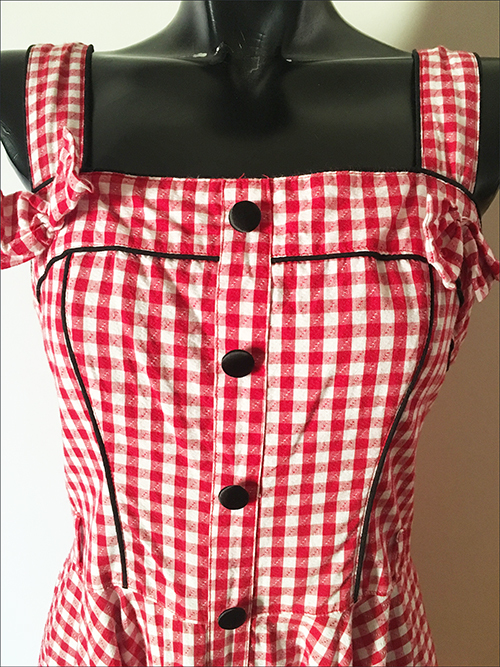 A Size 2XL which fits as about a Size 16-18 Australian, it measures about 110cm on the Bust, 94cm on the waist and 115cm long shoulder to hem, and in excellent, gently used condition. 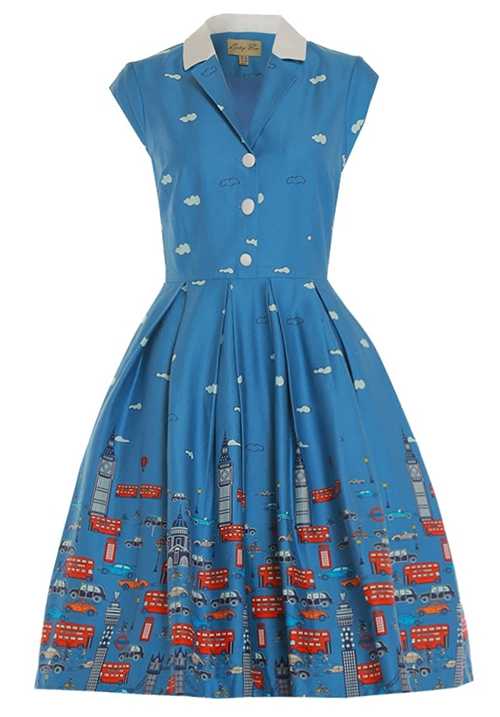 This weighs exactly 500g so just fits into the smaller satchel. 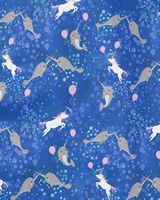 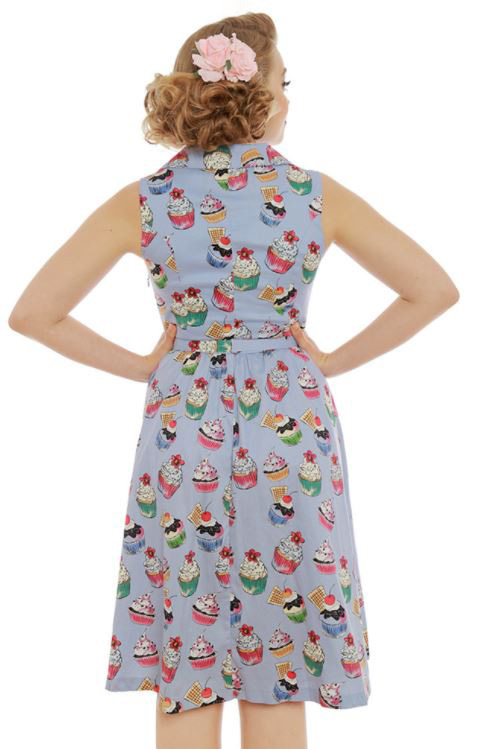 This is the gorgeous Matilda shirt dress from Lindy Bop in the fun Narwhal and Unicorn print. 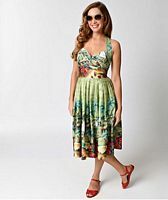 Sleeveless and with a fully lined bodice and front buttons, it's a UK/Australian Size 16, measuring about about 102cm on the bust under the arms, 84cm on the waist and 108cm long shoulder to hem. 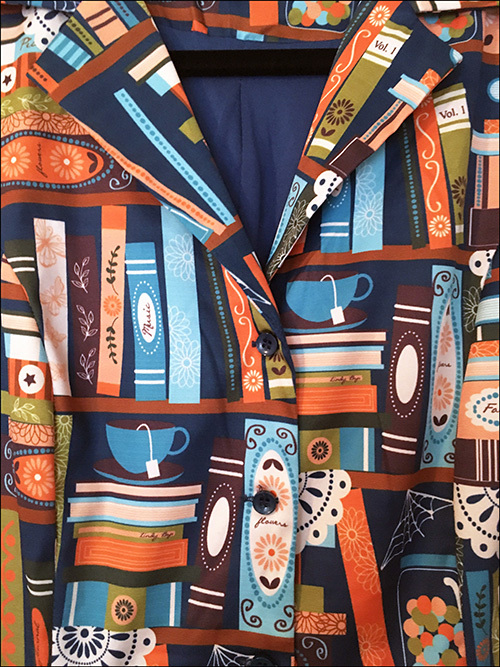 Only worn once, this could pass for new. 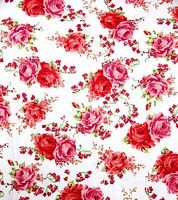 fabric has some stretch but also a decent thickness which doesn�t wrinkle. 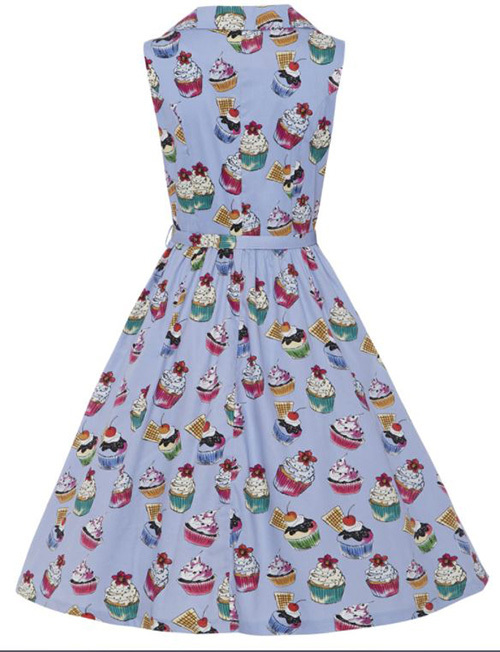 Emphasise the look with a petticoat - not included. 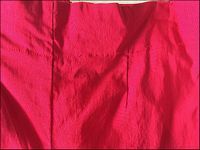 This is a UK/Australian Size 16, measuring about about 106cm on the bust under the arms, 88cm on the waist and 107cm long shoulder to hem. The Lindy Bop website gives the measurements as 42.1" Bust, 34.3" Waist, 42.5" length, 18.3" Armhole and 13" Cuff. 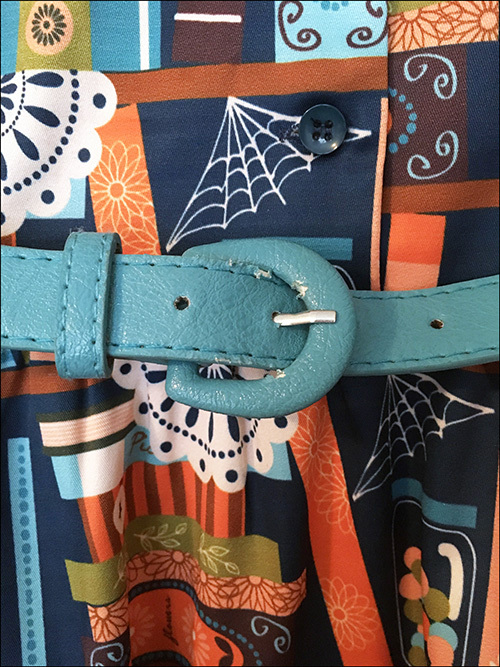 Worn and washed twice and in superb condition, the only sign of wear is some colour loss to the Turquoise belt. 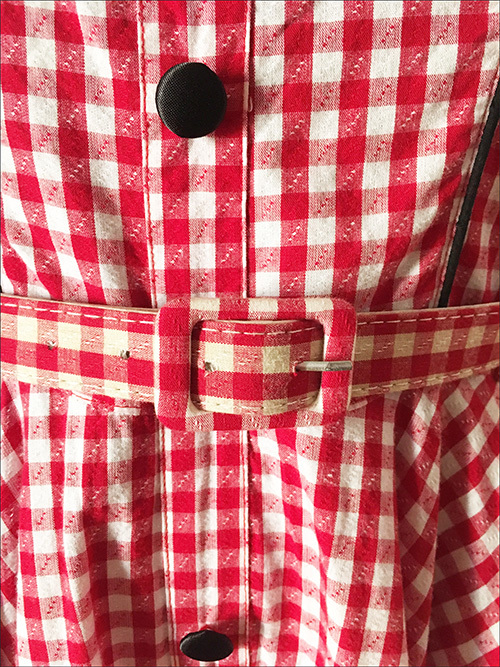 This weighs about 520g so will need the larger satchel. 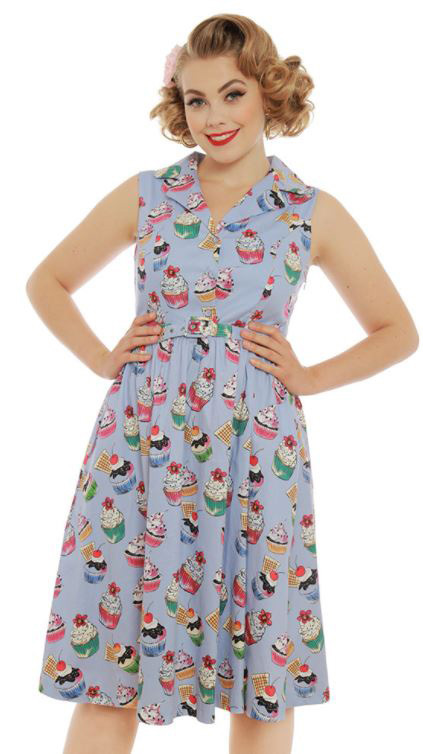 This is the gorgeous Matilda shirt dress from Lindy Bop in the Jacaranda Blue Cupcake print. 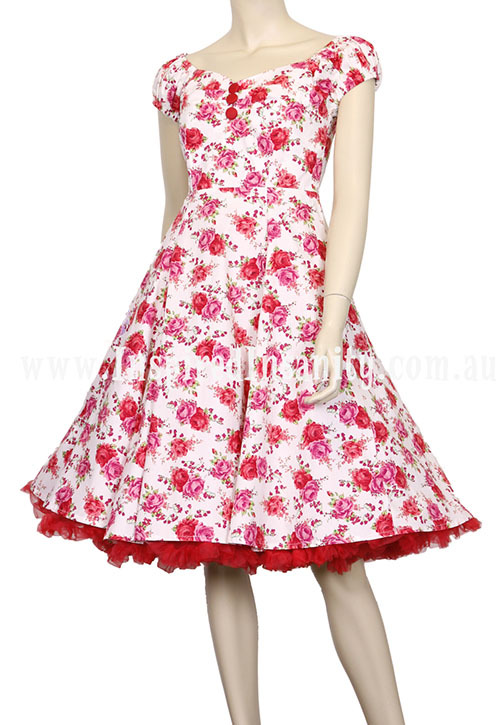 Sleeveless and with a fully lined bodice and front buttons, it's a UK/Australian Size 16, measuring about about 100cm on the bust under the arms, 86cm on the waist and 103cm long shoulder to hem. 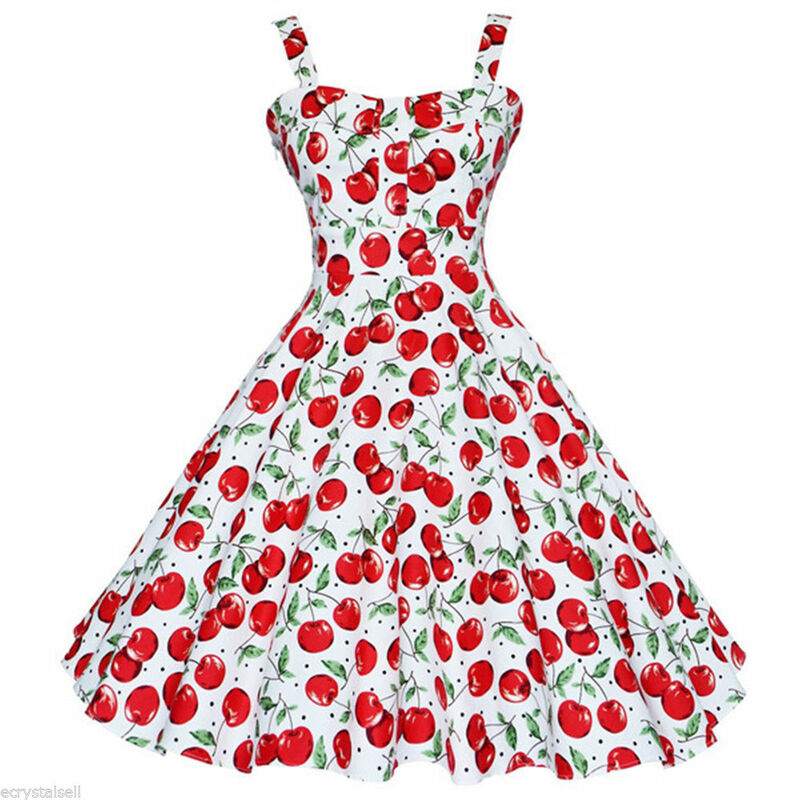 Only worn once, this could pass for new. These Hepburn dresses from Lady Vintage (Lady V) London are so comfortable and great for travelling as the fabric is so wrinkle-resistant. 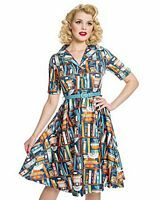 They're a heavyweight 95% Polyester 5% Elastane which drapes beautifully; sleeveless with a rear zip, full skirt and belt loops. 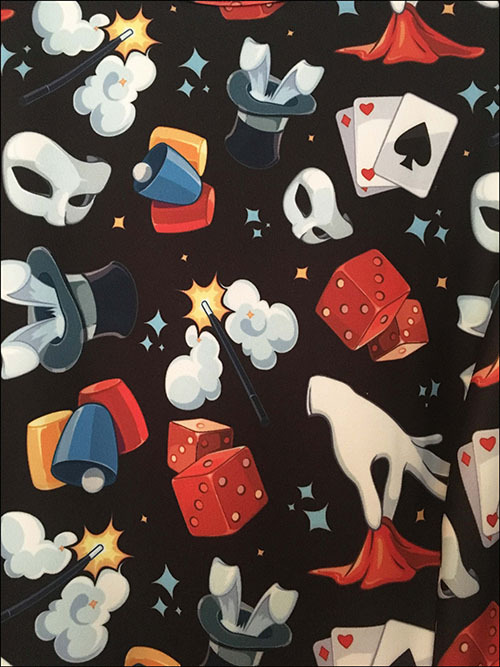 This is the "Black Magic" colourway with a fantastic, fun print of all sorts of magic tricks - playing cards, wands, dice, rabbits in hats etc. 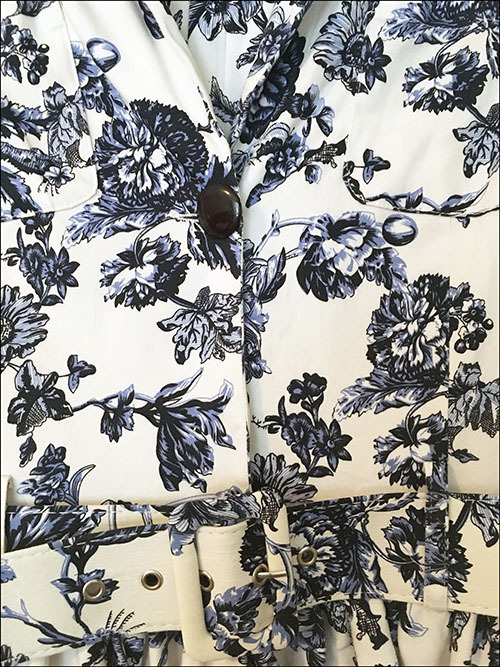 Size 16 UK/Australian, it measures, unstretched, about 104cm around the bust under the arms, 90cm on the waist and 110cm long shoulder to hem, and is in excellent, barely used condition - this fabric won't fade and it will continue to wear well. 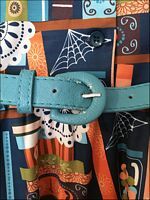 This weighs about 530g so will need the larger satchel. 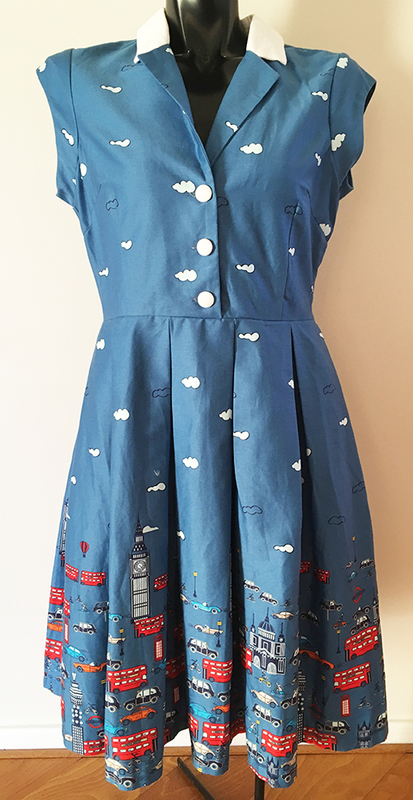 These Hepburn dresses from Lady Vintage (Lady V) London are so comfortable and great for travelling as the fabric is so wrinkle-resistant. 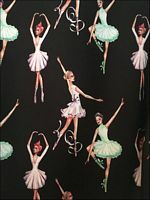 They're a heavyweight 95% Polyester 5% Elastane which drapes beautifully; sleeveless with a rear zip, full skirt and belt loops. 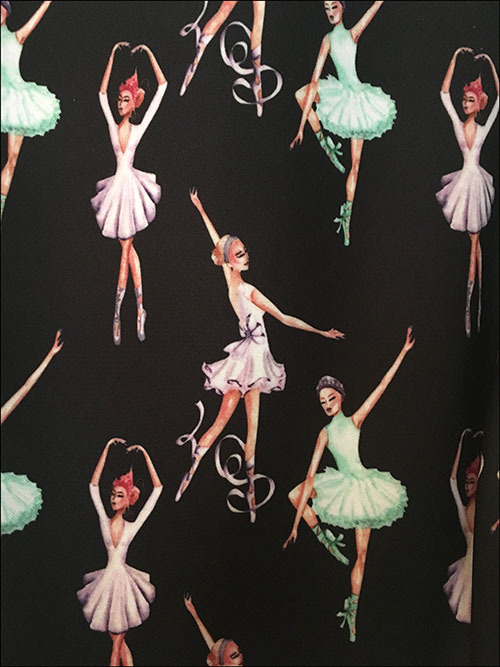 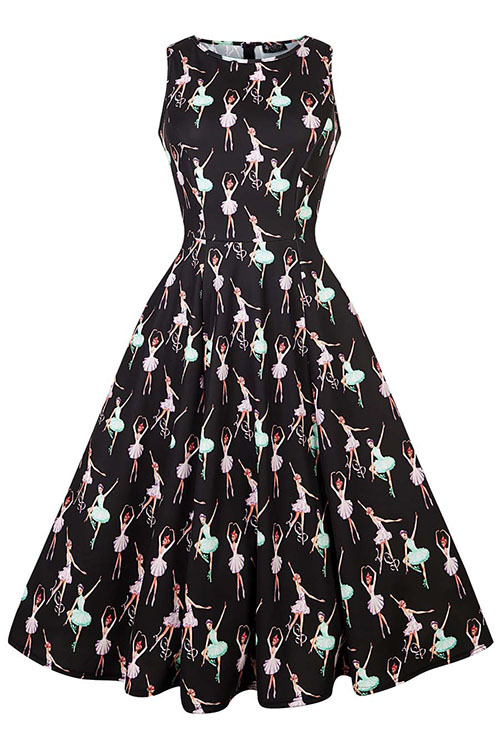 This is the "Pretty Ballerina" colourway with a beautiful pastel print of ballet dancers throughout. 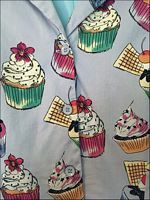 Size 16 UK/Australian, it measures, unstretched, about 104cm around the bust under the arms, 90cm on the waist and 110cm long shoulder to hem, and is in excellent, barely used condition - this fabric won't fade and it will continue to wear well. 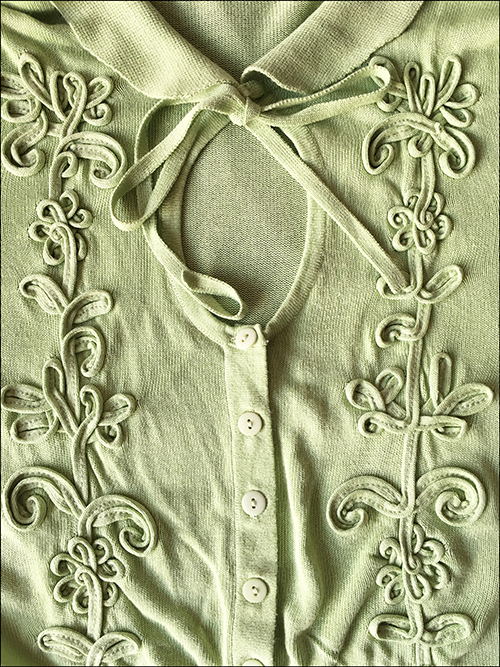 The only flaw is a few tiny fabric pulls on the bodice as I am a brooch wearer! 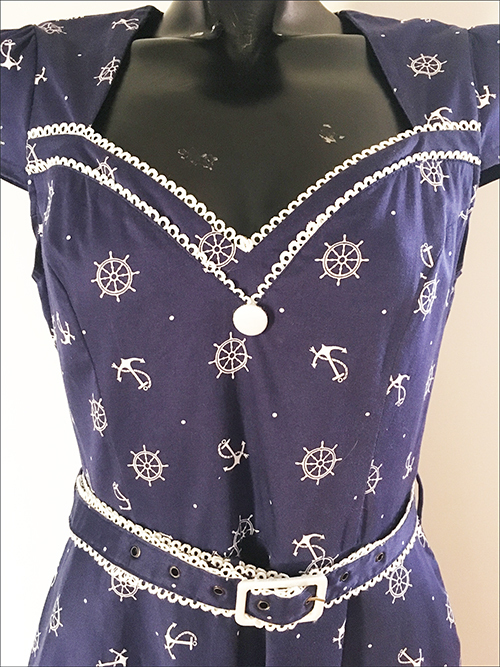 This includes a thin black velvet-look belt...this one hasn't been used as I tended to just use the ones from the other prints I had but in the spirit of honesty I can reveal these belts unfortunately don't wear terribly well so you may only get a few decent uses out of it! 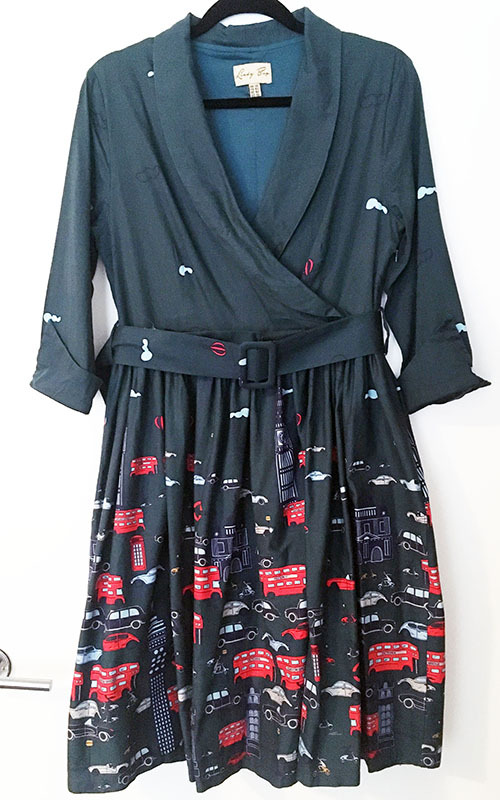 These Hepburn dresses from Lady Vintage (Lady V) London are so comfortable and great for travelling as the fabric is so wrinkle-resistant. 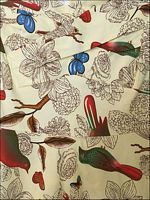 They're a heavyweight 95% Polyester 5% Elastane which drapes beautifully; sleeveless with a rear zip, full skirt and belt loops. 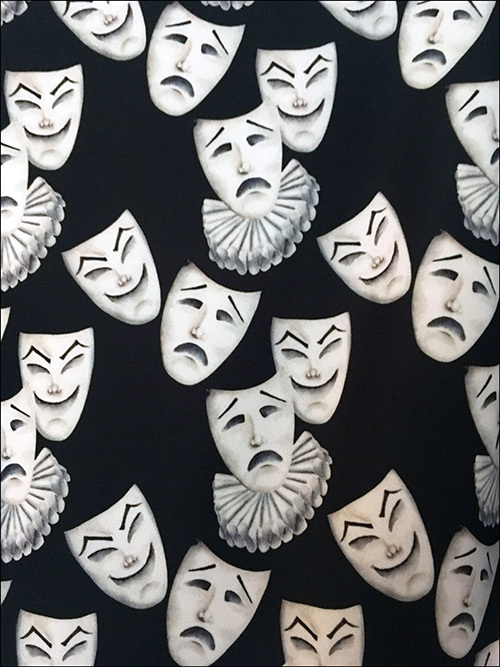 This is the "Theatrical Masks" colourway with a fantastic all-over print of theatre masks. 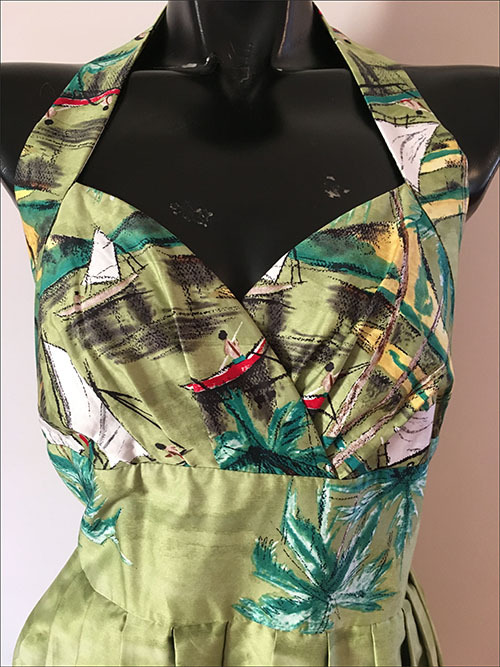 Size 16 UK/Australian, it measures, unstretched, about 104cm around the bust under the arms, 90cm on the waist and 110cm long shoulder to hem, and is in excellent, barely used condition - this fabric won't fade and it will continue to wear well. 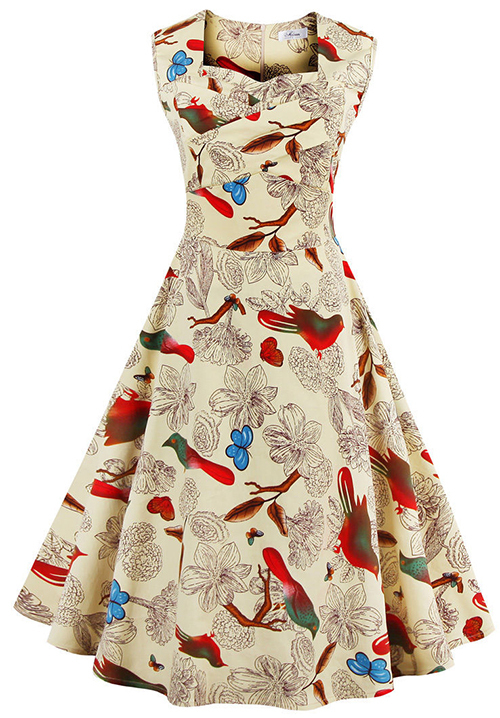 This beautiful dress from Zaful is in a beige stretch 95% Cotton 5% Spandex blend with a bird and butterfly print, and features a gorgeous and flattering gathered sweetheart neckline and full skirt. 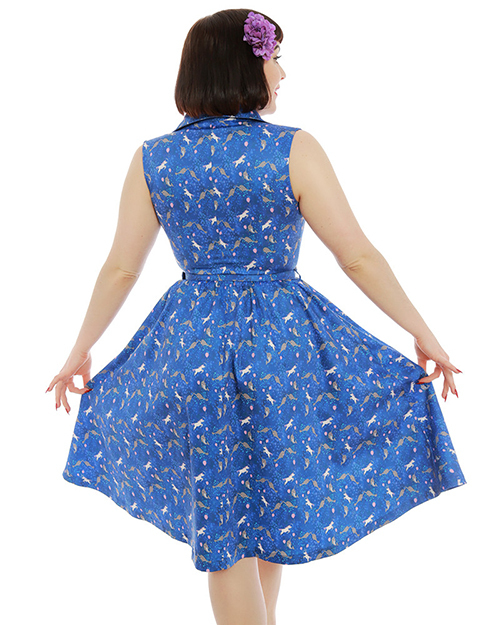 It fastens with a rear zip and is really pretty on. 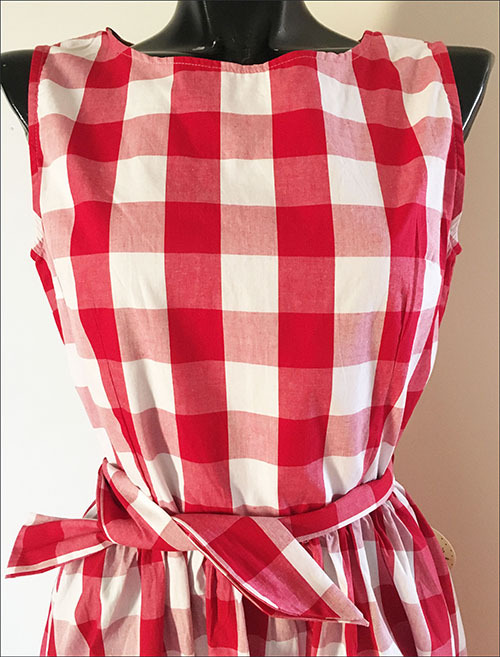 Only worn a couple of times, this has zero wash fade or wear - the seam under the right arm has a bit of a dodgy join-up but this isn't seen when worn. This is a Size XL, and fits as an Australian Size 14-16, measuring, unstretched, about 96cm on the Bust, 82cm on the waist and 104cm long shoulder to hem. 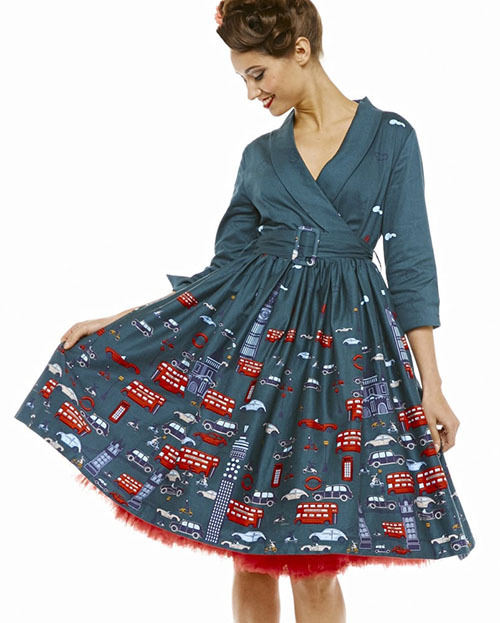 This is the fabulous Vivi dress from Lindy Bop in the Teal London Traffic colourway. Made from a good quality, stretch cotton fabric and designed for a comfortable fit, it features a wrap front lined bodice with collar detail, 3/4 length sleeves with cuffs, a gathered waist and wide flared 1950's style skirt. 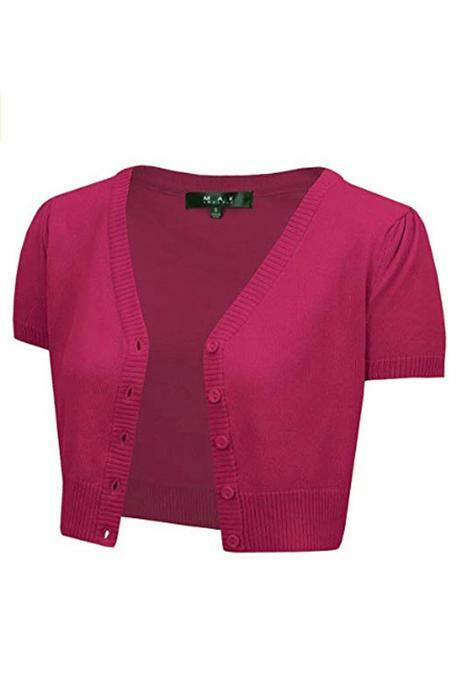 It fastens with a concealed side seam zip fastening and has a detachable belt. 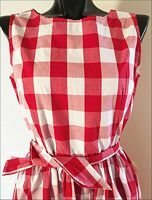 Size UK14 (42 French, 40 German, 10US), it measures, unstretched, about 96cm around the bust under the arms, 84cm on the waist and 100cm long shoulder to hem, and is in good used condition with just mild, even wash fade, and a tiny bit of wear to the top of wear the side zip ends (not seen when worn). 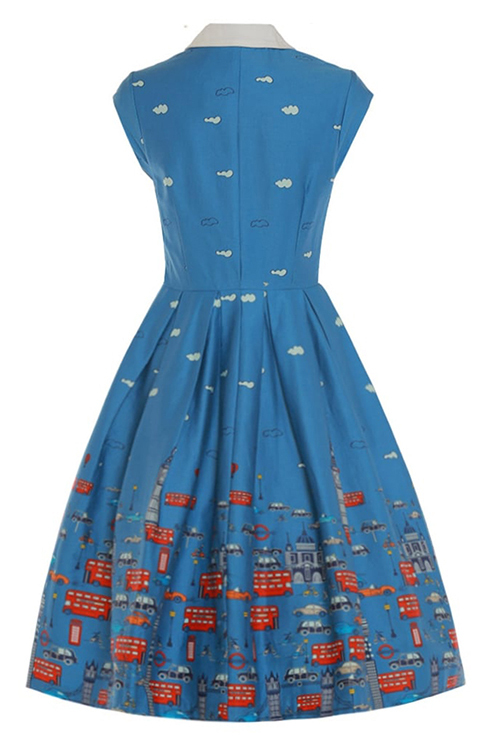 This weighs about 565g so will need the larger satchel. 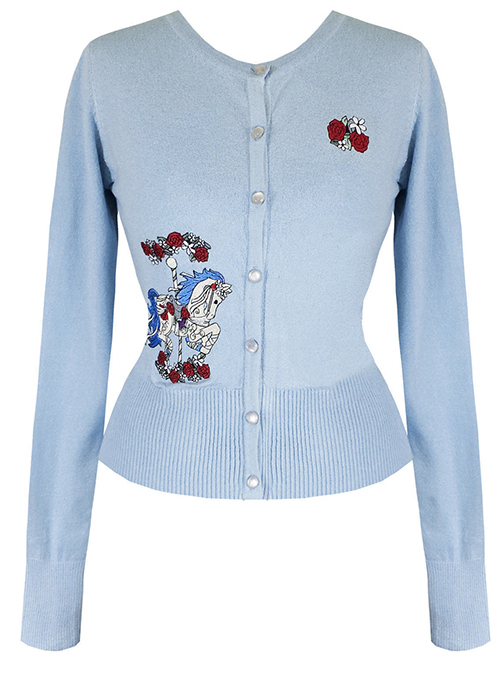 The Afternoon Cardigan oozes a retrolicious vibe with its cropped length, front keyhole and tie opening, collar and delicate knitting detail on the front panels. 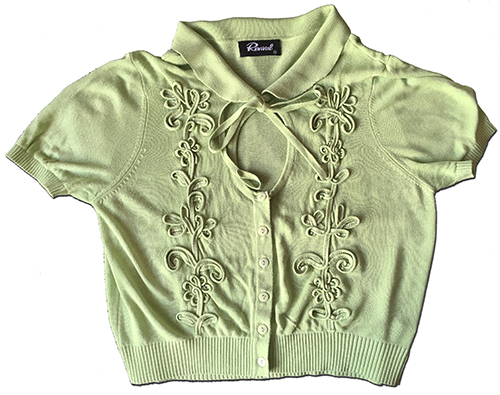 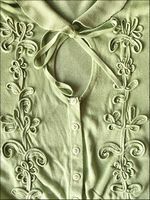 Made of a soft viscose in the loveliest shade of pastel green (the stock photos show a different colourway), this cardigan is suitable for both casual and special occasions. 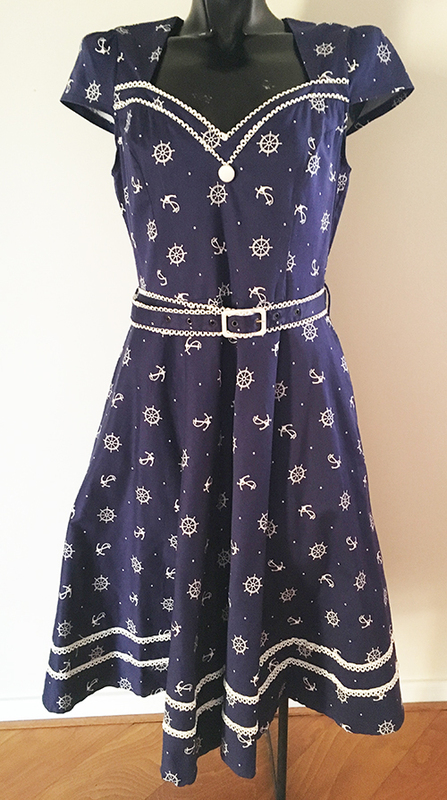 A generous size 14, it's about 102cm around the bust under the arms, 76cm on the waist unstretched and 46cm long shoulder to hem, and is in excellent, gently used condition. 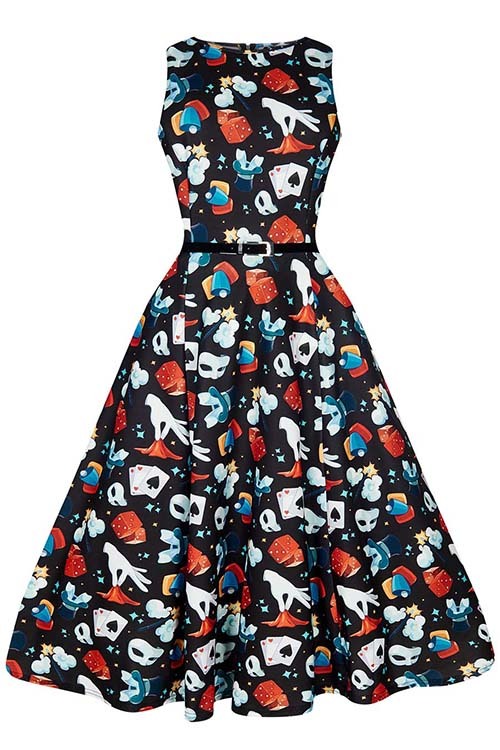 This retailed at $79. 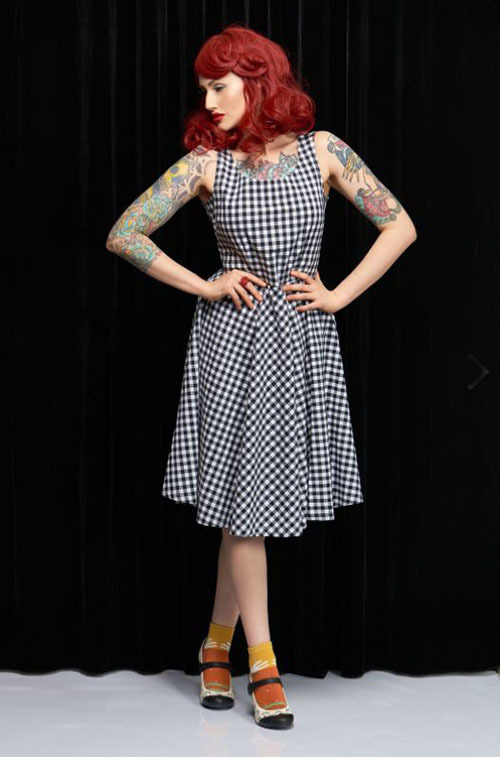 One of my all-time favourite dresses from Revival (Dangerfield) - the Sarah Jane in a black and white gingham 60% Cotton, 37% Polyester and 3% Elastane blend. It's a cool, sleeveless design with rear zip and full circle skirt, and is a generous Size 16, measuring about 108cm on the bust under the arms, 96cm on the waist and 105cm long shoulder to hem. This has been worn many times but retains its colour well. 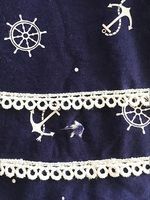 Priced low due to some marking under the arms and some small thread pulls, mainly on the left side of the bodice, as a result of brooch wearing. 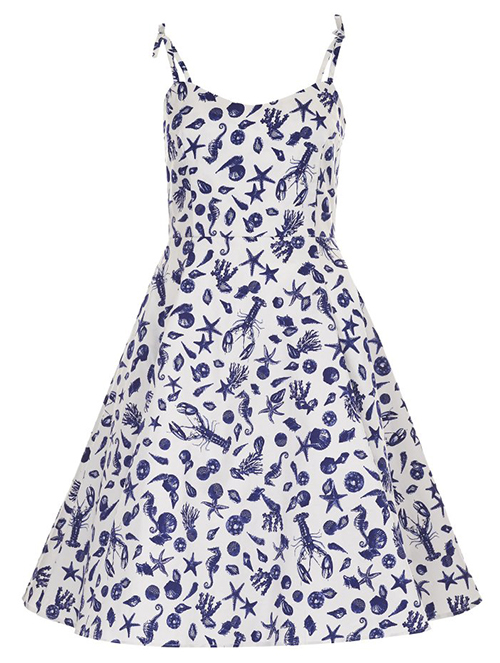 Tonnes of life left in this dress yet. 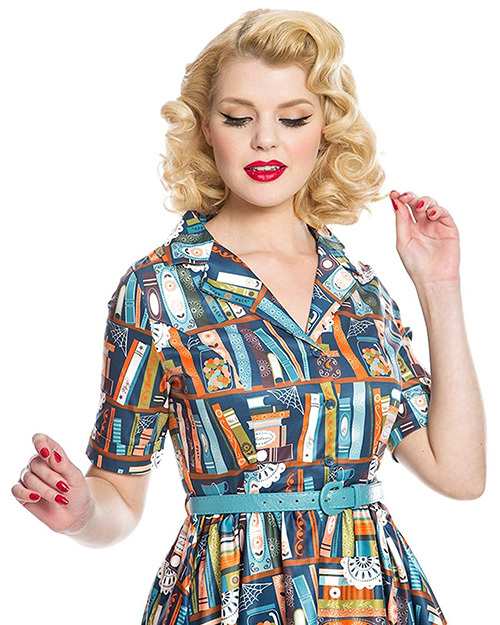 This is the gorgeous Alexis Shirt Dress from Unique Vintage - from their site, "We�re over the rainbow for Alexis, dames! 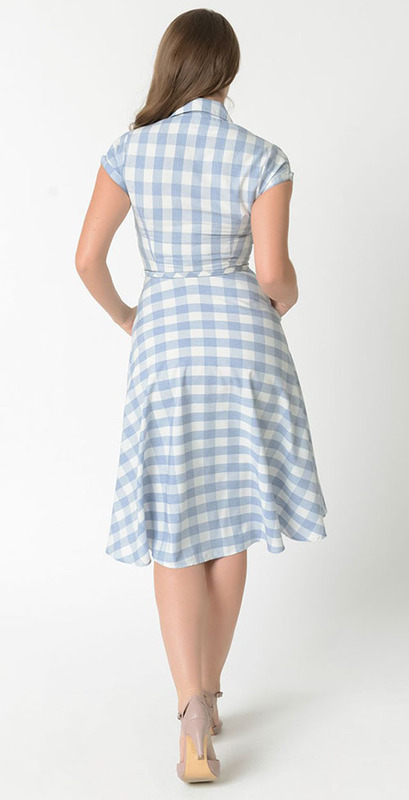 A beautiful vintage inspired dress, The Alexis Shirtdress is a marvelous frock from Unique Vintage styled with lovely light blue and white gingham print, crafted in a lightweight woven blend for Pin-up perfection! 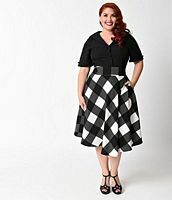 The three-quarter button up front fits to your form with a darted bodice, seamed waist, and charming gingham belt, while the notched collar and cap sleeves lend eye-catching vintage design. 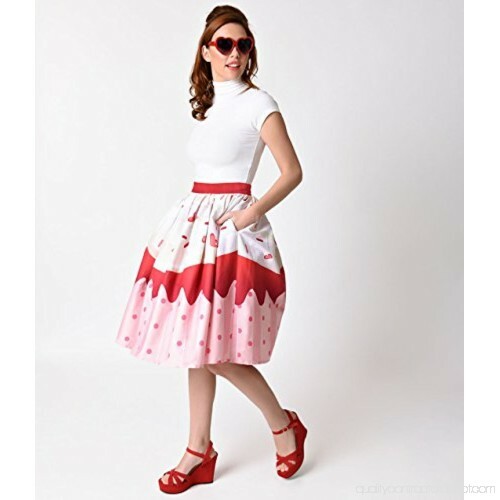 Outfitted with side pockets, the graceful unlined swing skirt playfully floats around the knees, grab the ruby slippers and head out for an adventure!". 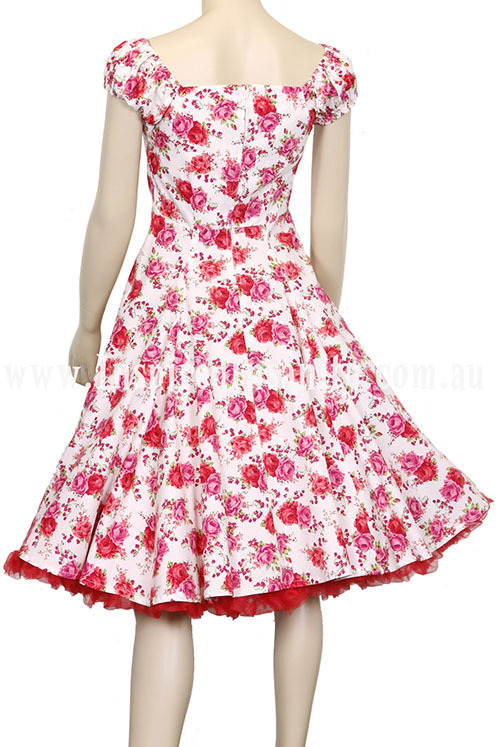 This is a Size XL to fit US 12/14, Bust 41-42", Waist 33-34" and Hip 44-45", however I felt this ran small (especially on the bust) and more like a Unique Vintage Large or an Australian Size 14. It measures about 100cm on the Bust, 84cm on the waist and 117cm long shoulder to hem, and the polyester fabric has no stretch. 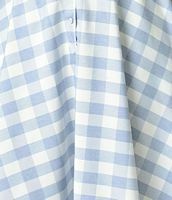 The "Dorothy" blue and white in the stock photos is also somewhat misleading - it's far more of a periwinkle blue in real life as shown in my photos of the actual garment. It's brand new with tags and priced far lower than retail. 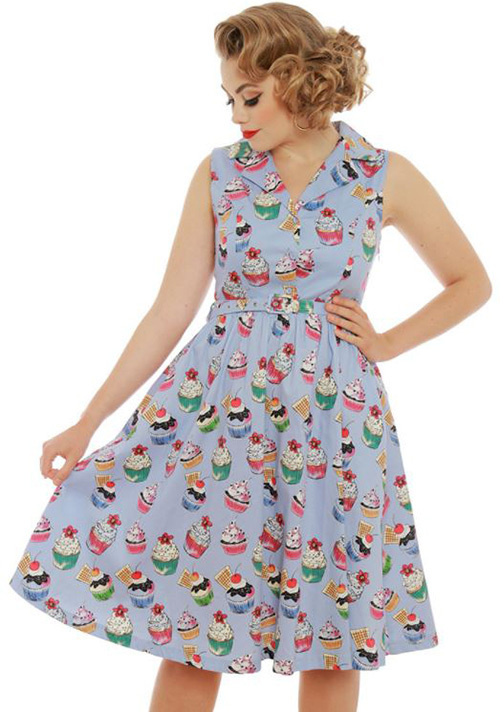 Give us a some sugar, darlings! 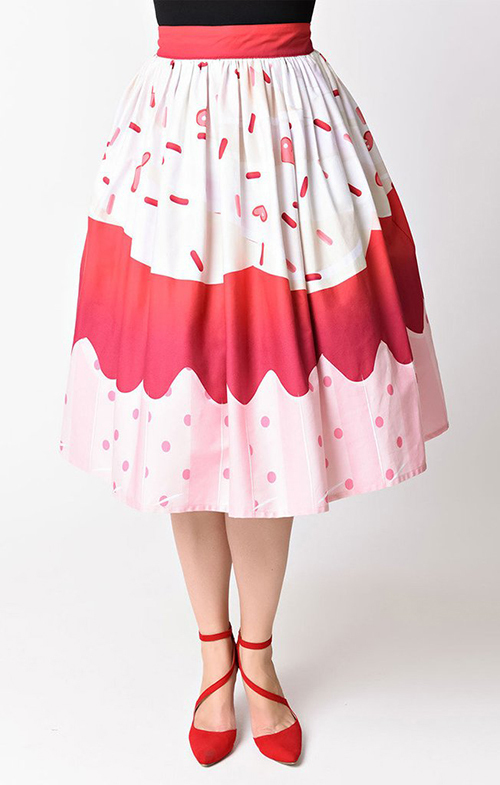 Freshly baked from Unique Vintage, this magnificent 1950s inspired circle skirt is printed in a sumptuously sweet high definition red velvet cupcake and sprinkles print in an eye catching layered design. With a red banded high waist and gathered and frosted A-line silhouette, this tantalizing reproduction vintage skirt has hidden side pockets and is topped off with a darling back button - perfectly Pin-up and palatable! 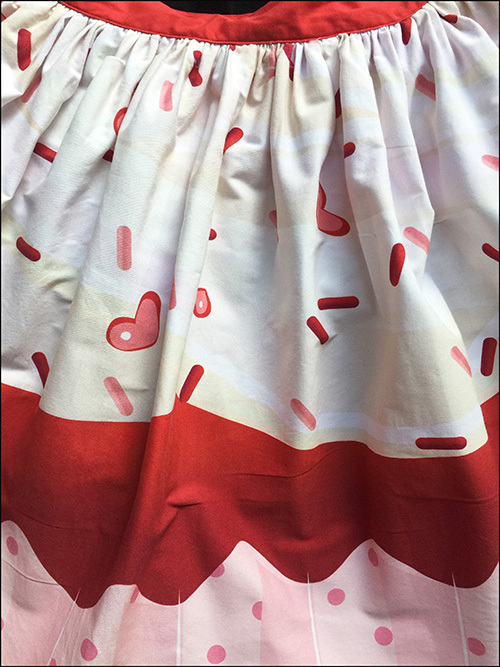 Petticoat added for volume, not included. 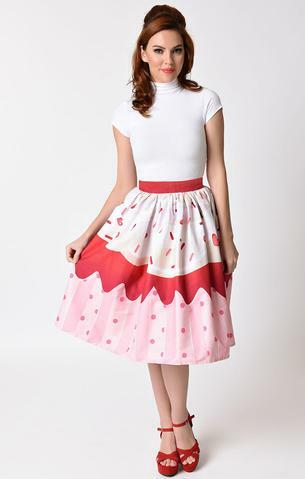 Made from 100% cotton and machine washable, these skirts usually retail at around $130 so my price here is a steal. 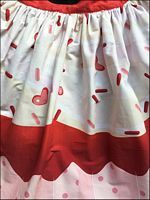 Size XL to fit waist 33", it measures about 84cm on the waist and 63cm long and is in excellent used condition with just some light wash fade to the red waistband - hard to avoid in bold colours. 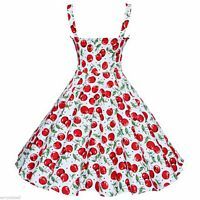 TThis is the stunning Cherry Bomb dress from Revival (Dangerfield), in a black and white polkadot cotton with a striking large cherry print border, rear zip and beautiful, flattering pleated bodice. 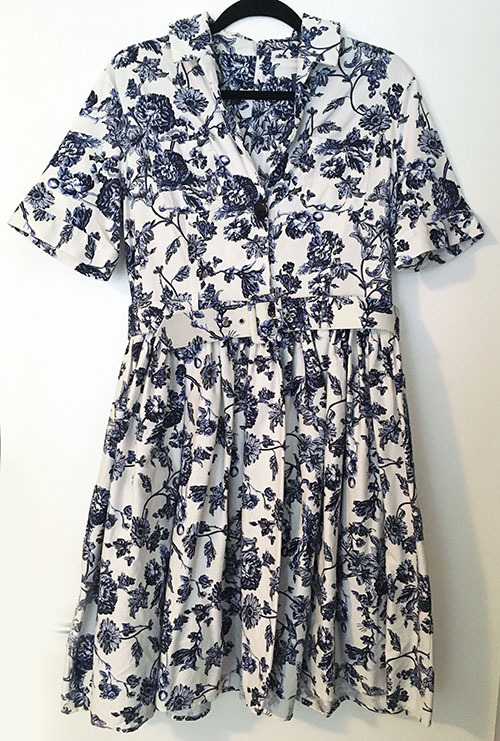 Size 16, it's about 96cm around the bust under the arms, 86cm around the waist and 99cm long shoulder to hem, and in excellent, barely used condition. 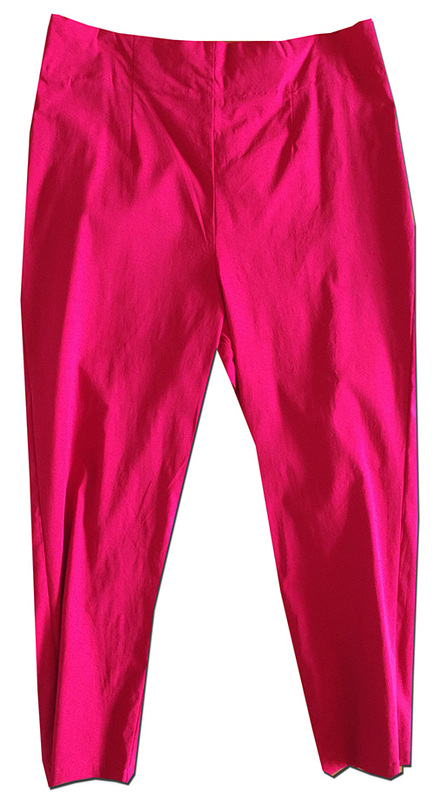 These are the gorgeous and oh-so-comfortable Tina Capri pants from Hell Bunny, in the fire-engine red colourway - a really difficult colour to capture and far more like the stock photo than my shots of the actual garment. 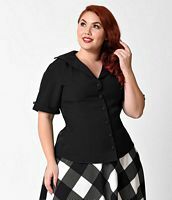 These fitted pedal pushers are in a 75% Rayon, 22% Nylon 3% Elastane blend and feature a self fabric waistband, darts in the front to shape, centre seam with zip on the back and a cute v-shaped gap at rear the hem of each leg. 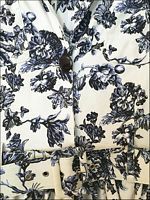 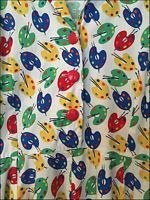 Size XL/UK 16 to fit Bust 102cm, Waist 85cm and Hip 109cm, they measure, unstretched, about 80cm on the waist, 83cm long waistband to hem and 53cm long on the leg inseam. 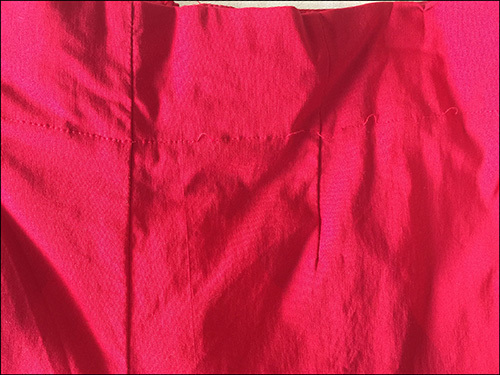 These were only worn twice and are in sensational condition with zero wash fade and the only sign of wear being that some of the topstitching on the waistband has unraveled in small sections here and there as shown in the close-up shot. 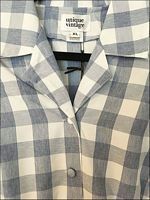 Still fully functional with a tonne of life left in them, and priced at a fraction of their $68 retail cost. 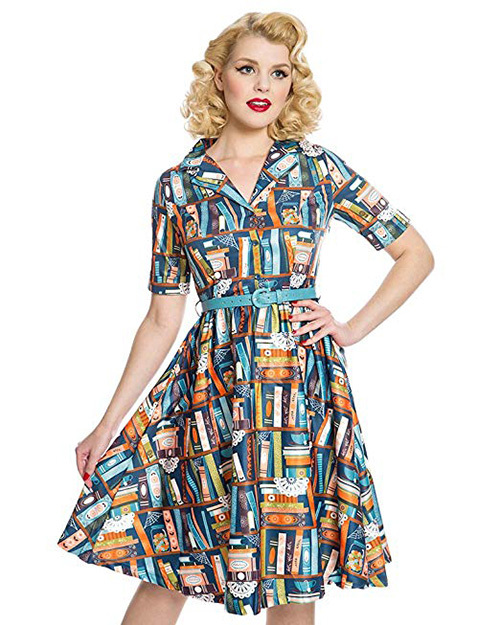 These fit into a 500g satchel.